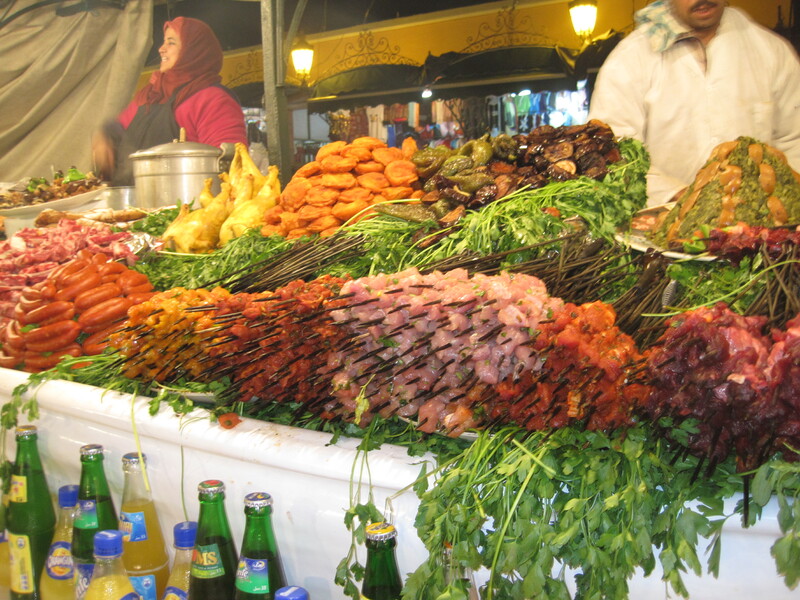 As discussed in the previous post, Morocco is an incredible place for looking at food. It’s also a great place to eat, and I like to eat. 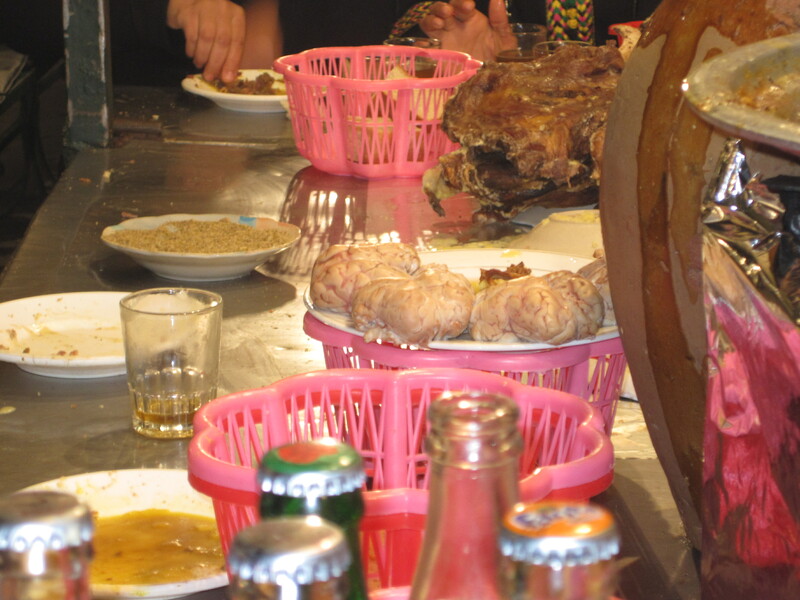 So this entry is about the eating, and a little bit of the travels. 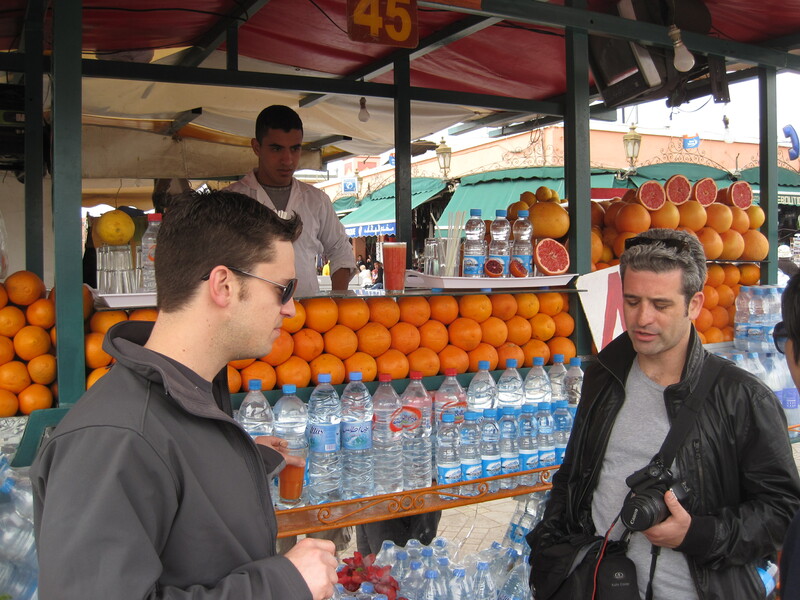 After an overnight direct flight from JFK we landed in Casablanca and had a brief layover before hopping on a train to Fes which was about three hours away. Because we hadn’t eaten since the previous night, I was hungry but hoping to hold out for grilled meat somewhere. So we started with some coffee, croissants, mint tea, and banana milk. 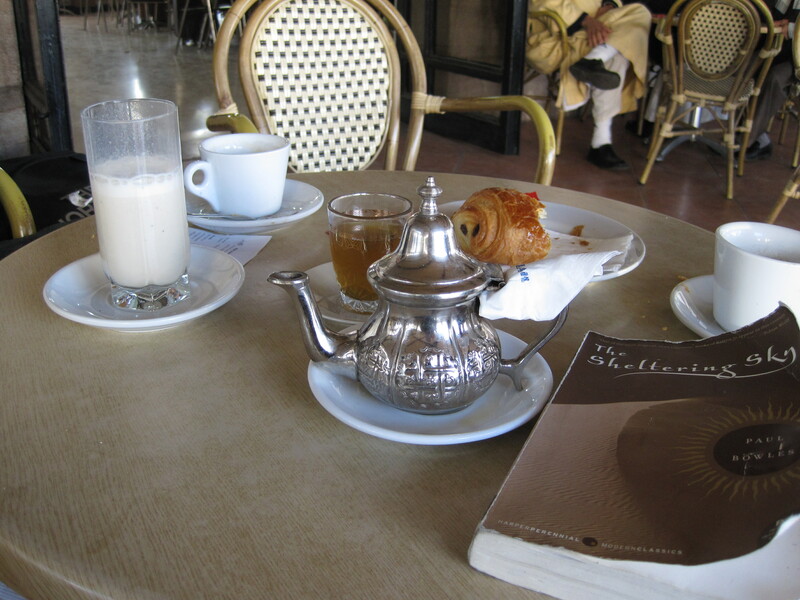 Mint tea is served as a greeting everywhere you go in Morocco. It’s black tea, fresh mint leaves, and a few cubes of sugar steeped together. Always served from a silver teapot into glasses instead of ceramic mugs. It’s sweetness and warmth were welcome due to the chilly temperatures at the time we visited. 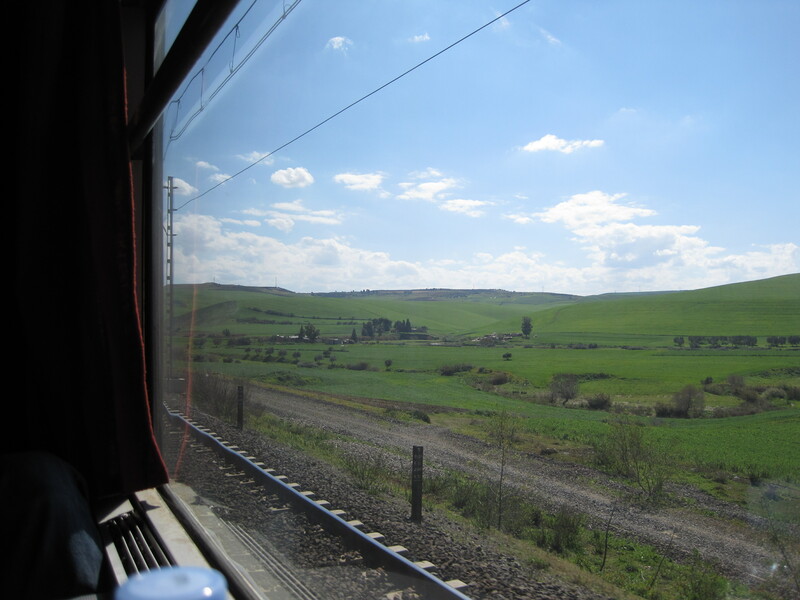 En route to Fes, the landscape was not what I expected at all; lots of rolling green hills with delicious animals grazing on them. 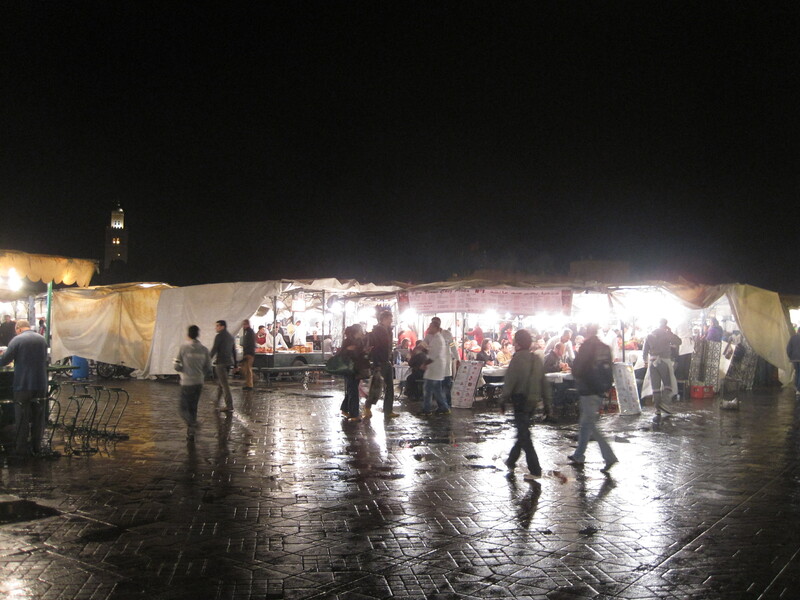 After arriving in Fes, we took a cab to our riad and discovered that, since it was Friday, most of the medina was shut down. I was starving and devastated. 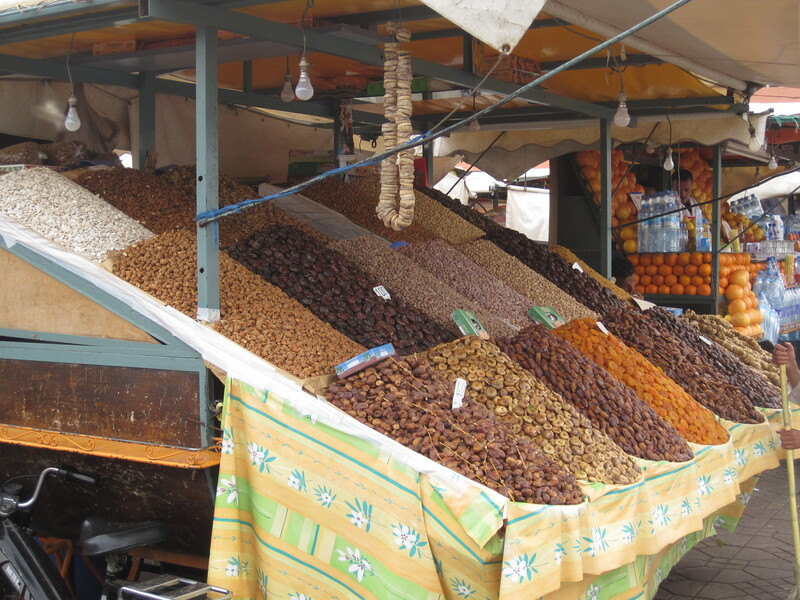 So we headed to the souk in the new section of Fes and I prayed to find something edible there. Luckily, shortly after exiting the cab, I saw some locals hanging around a counter with this behind the glass. Sure there was chicken, lamb kefta, and beef, but that skewer of liver looked too good to pass up. Or was it kidney? The dude running the stall responded to that question (asked in English) by mooing at me. Glad we got that straightened out. I ordered 4 skewers for 10 dihram (or $1.25) grilled and served inside half a loaf of khobz and sprinkled with cumin, salt, paprika and some sort of chili pepper. I decided it was liver, despite having a little bit of crunch to it which was unexpected. The best and most flavorful bites were the ones that included the one piece of fat on each skewer which you may have noticed in the previous picture. 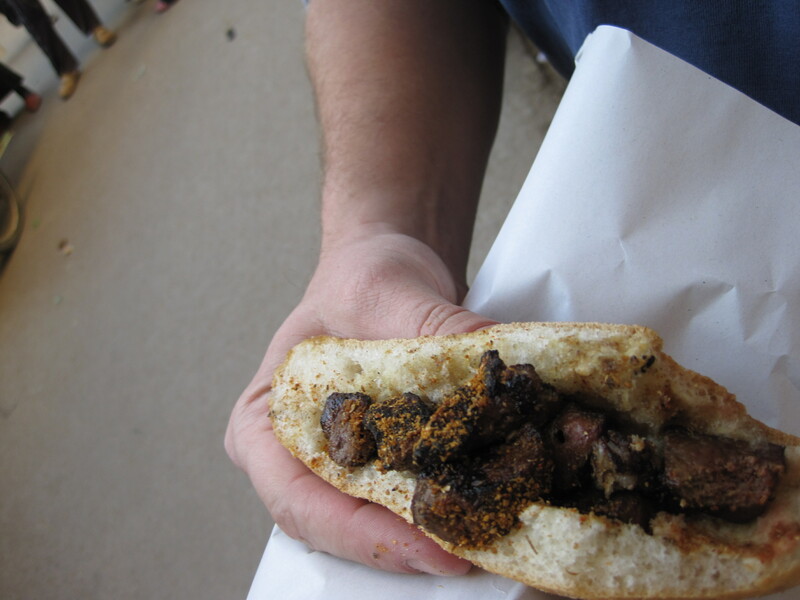 Overall, I though the liver had a surprisingly mild flavor and the sandwich was very tasty if a little dry. Danny disagreed with my assessment when he tasted it, so I guess i just like liver. 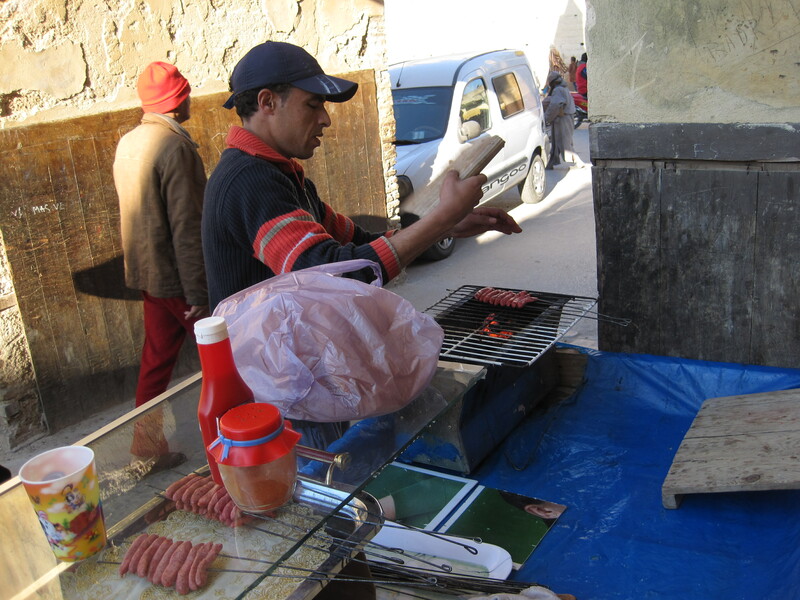 To get that taste out of his mouth, we found a guy who was cooking small links of merguez sausage inside the souk. 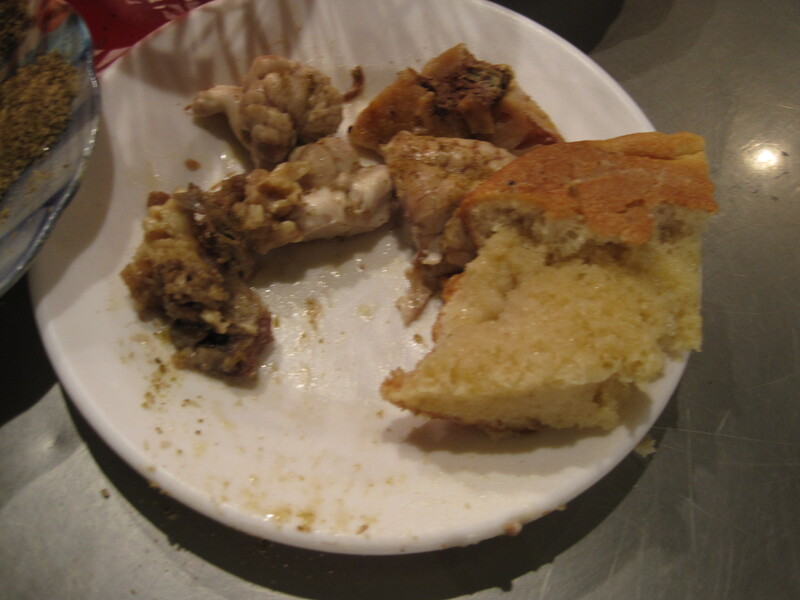 This was served identically to the liver: pulled off the skewers into a half loaf of local bread. Danny and Zach both ate it without complaint, but it was definitely a little funky. The sausage was mainly blood and fat and tasted like it, but for a dollar on the street we didn’t expect much more than that. 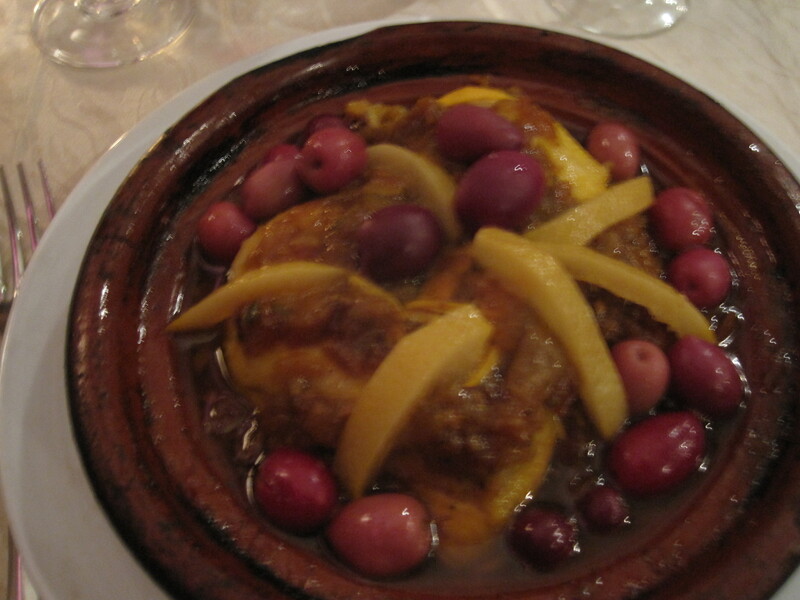 After picking up Jae at the train station, we headed out for dinner where I had my first tagine. 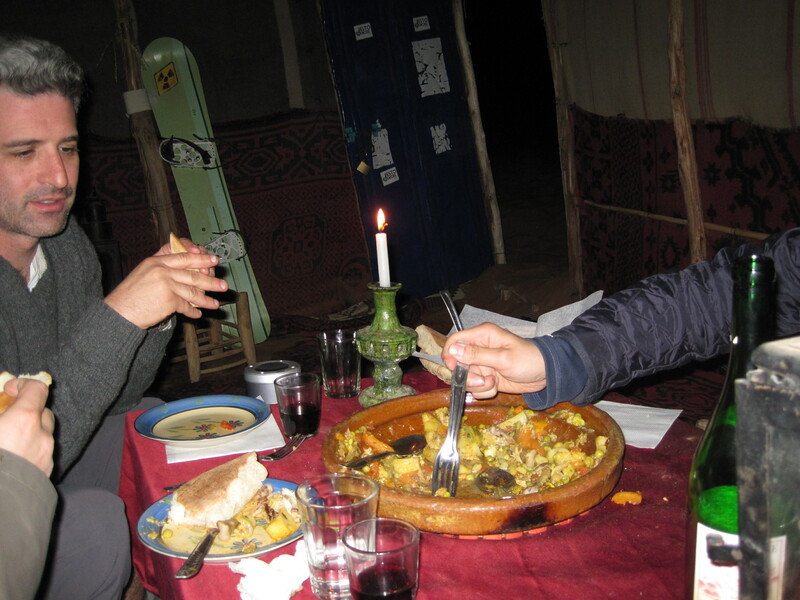 Tagine is a ceramic dish with a cone-like top, but its also a style of food; basically a one pot slow cooked meal. It was a little subpar. Whole slices of salted preserved lemon rinds, un-pitted olives, and a half chicken all cooked together. If the tagine had a bed of couscous, it would have been a hundred times better, but instead it was just a lot of strong flavors with nothing neutral to absorb them. Oh well, we quickly learned that restaurants weren’t where you found the best food. The next day Mohammed, our previously discussed guide for the day, brought us to a restaurant inside the medina for lunch. We knew we were being pulled into a tourist trap owned by Mohammed’s buddies, but the food ended up being relatively decent. 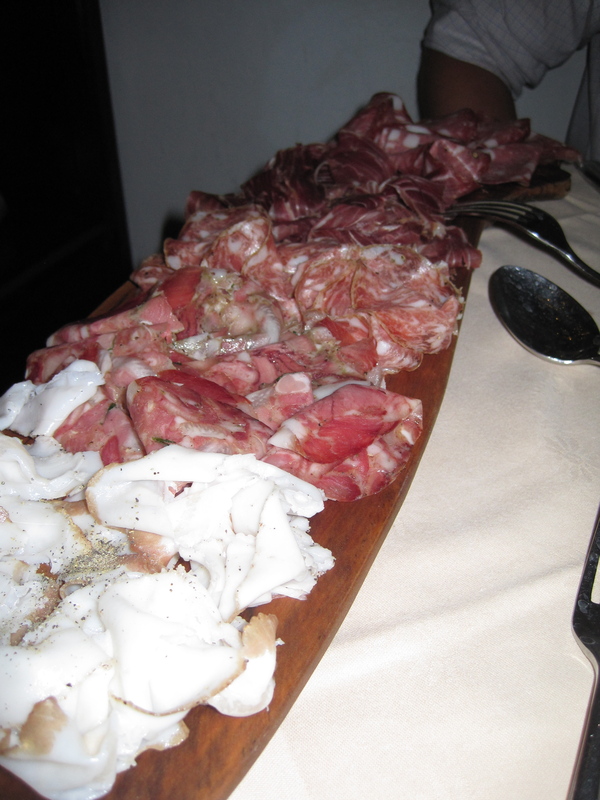 We were started off with a bunch of small cold appetizers which you piled up on local bread. The main event for me, and something Mohammed promised me I would be able to order, was pigeon pastilla, or pigeon pie. 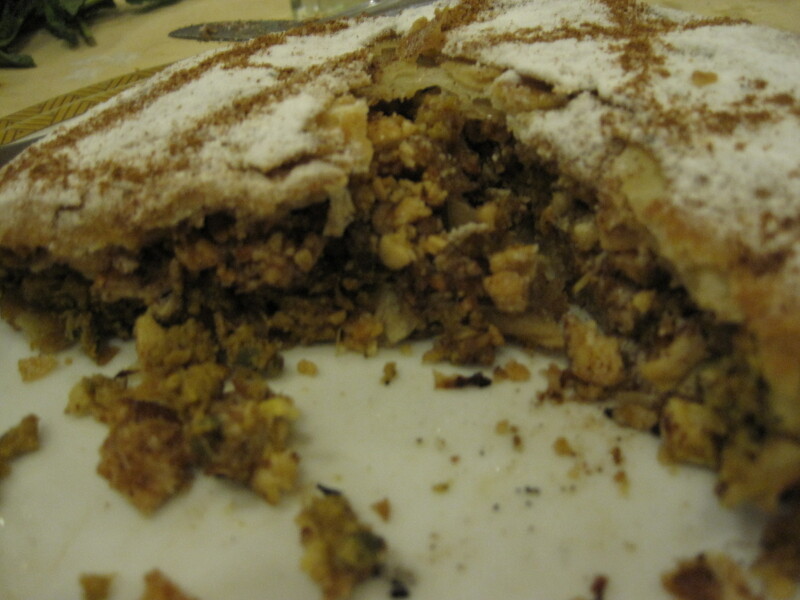 The pastilla was in an individual portion size and was basically a pastry filled with pigeon meat (some still on the bone), nuts, eggs, and spices. The tiny bones were annoying. Some were soft enough to easily chew, but others had to be fished out in the mouth and removed. I was getting more comfortable with this process from my time in China, but it made for a less enjoyable experience. The flavor of the spices and pigeon meat was great, though. 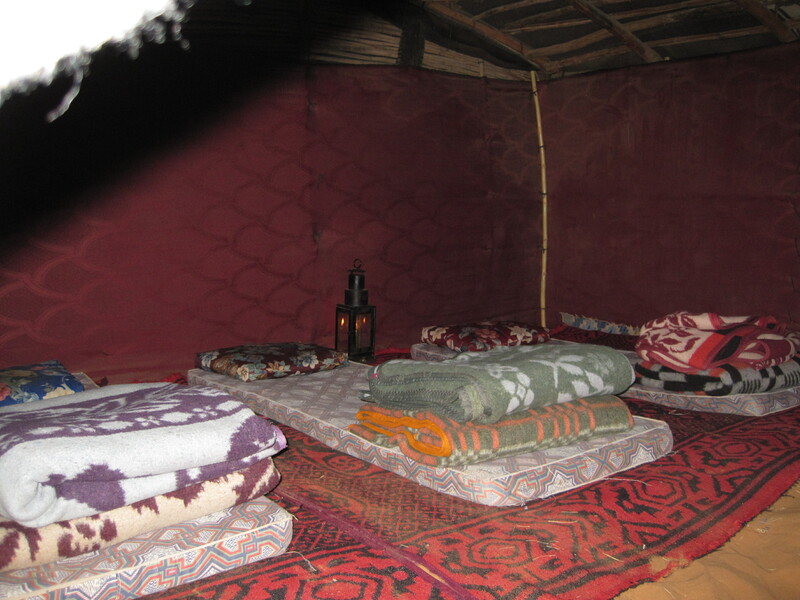 The next day we took a minibus to Merzouga on the fringe of the Sahara desert where we planned to ride camels into the desert and stay in a Berber camp for the night. Which we did. Camels are deceptively tall, extremely wide around the midsection, pretty cranky, and carry a unique odor. Which meant we had a lot in common. Camels are also remarkably comfortable with carrying over 200 pounds of DB on their back over steep dunes on shifting sand. 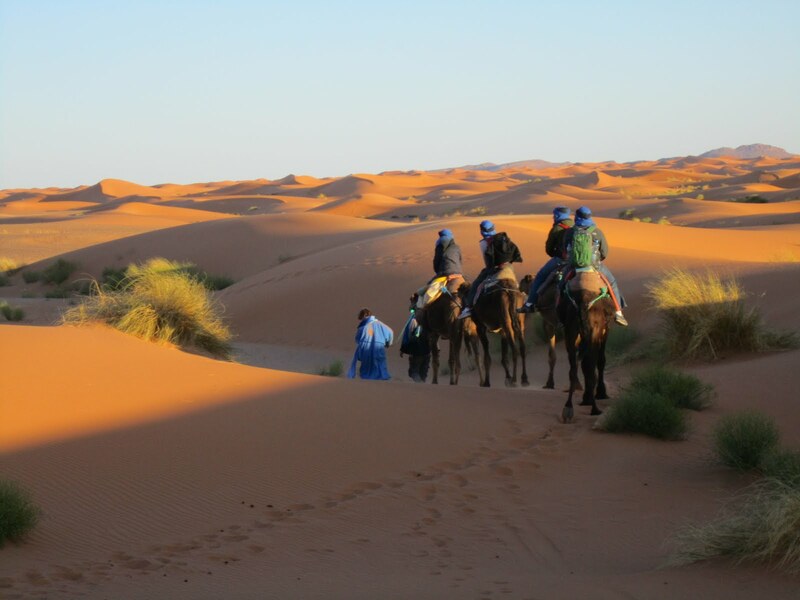 Shortly after sunset, our camels completed their seven kilometer trip into the desert and dropped us off at the Berber camp where we would spend the night. Over in the main tent, which was about the same size, we waited anxiously for our guides to cook dinner since we ate an early lunch and hadn’t settled at camp until long after dark. 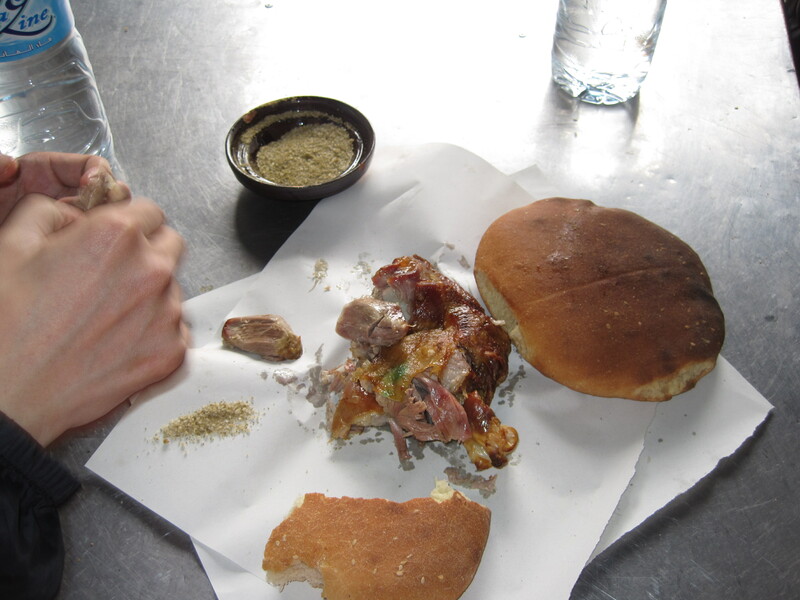 The first course of khobz and soup, that I think was made from bones, vegetables and pieces of lamb fat, was one of the most welcome and enjoyable eating experiences of my life. I inhaled this soup due to hunger but it was definitely good. Not an overwhelming amount of saltiness, and the occasional white blob of fat that gave the soup it’s meaty flavor. Next up was a tagine of chicken, root vegetables, and couscous. The chicken was a half bird with heart and liver still attached to the ribs. Pretty strong tasting, but a great meal to put us all to sleep. 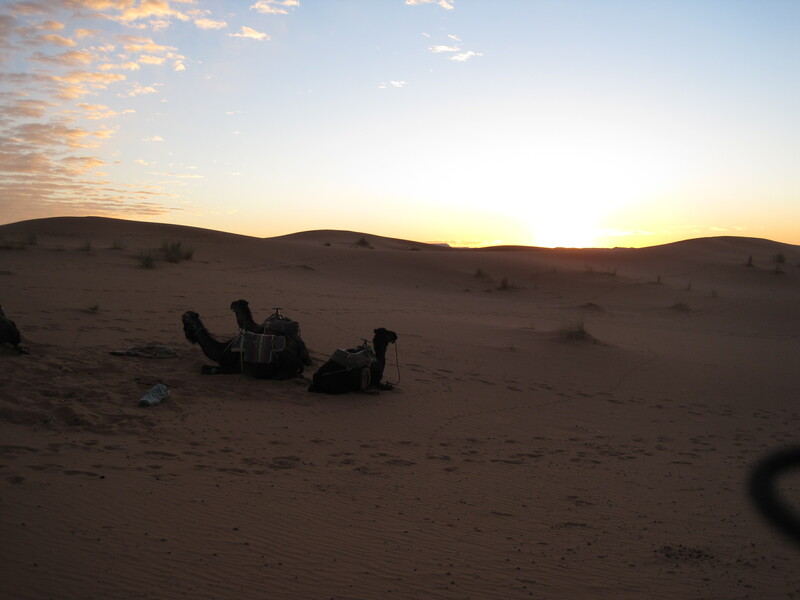 We woke with the sunrise to head out of the desert. 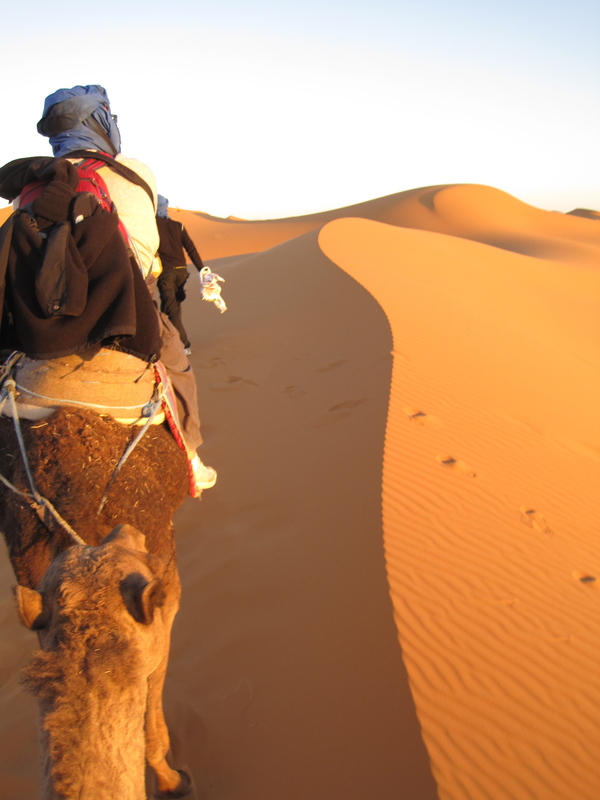 Over the next two days we made our way to Marrakech at a leisurely pace. We stopped often to take in amazing sights like the Dades Valley and gorges, the High Atlas mountains, Ait Benhaddou, and the film studio at Ouarzazate. 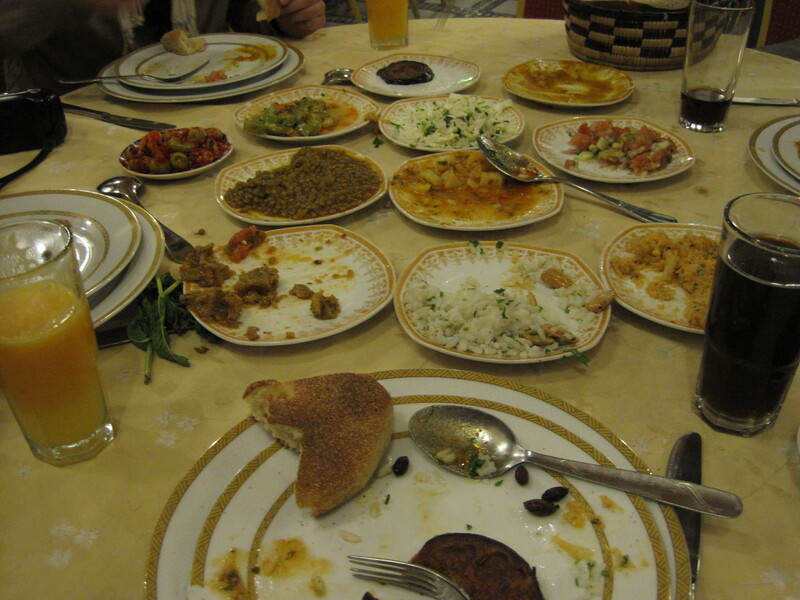 I also got pretty sick of eating tagines and looked forward to the food that Marrakech would have to offer. It didn’t disappoint. 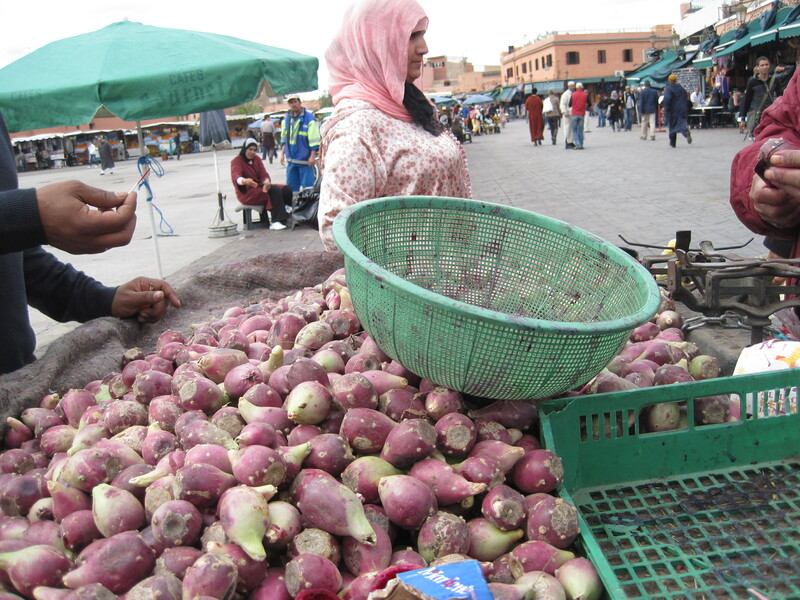 The main square in Marrakech is called Djemaa el Fna. You should have seen how I spelled that before googling it; it looked like I sat on the keyboard. 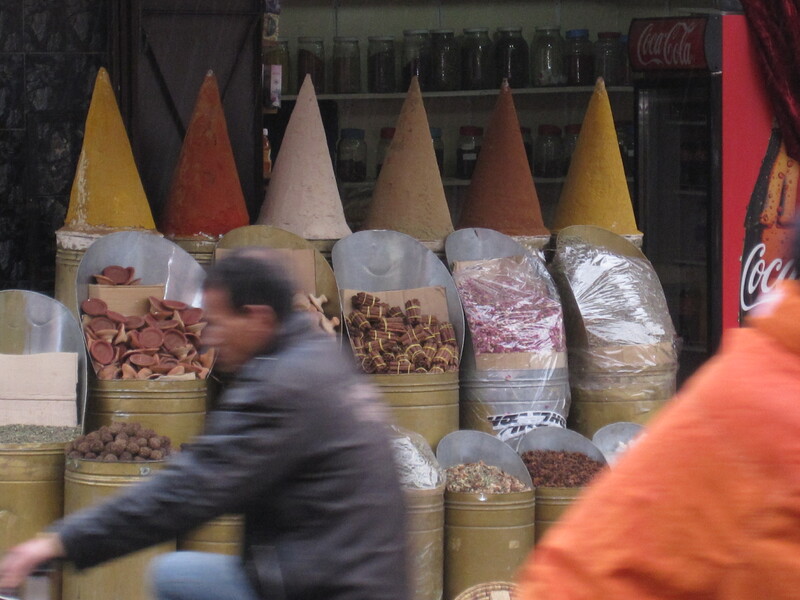 During the day it’s mostly street performances along with dates, juice, and spice vendors. Its a pretty intimidating place because its huge and there is constantly someone trying to sell you something or throwing some sort of animal on you. 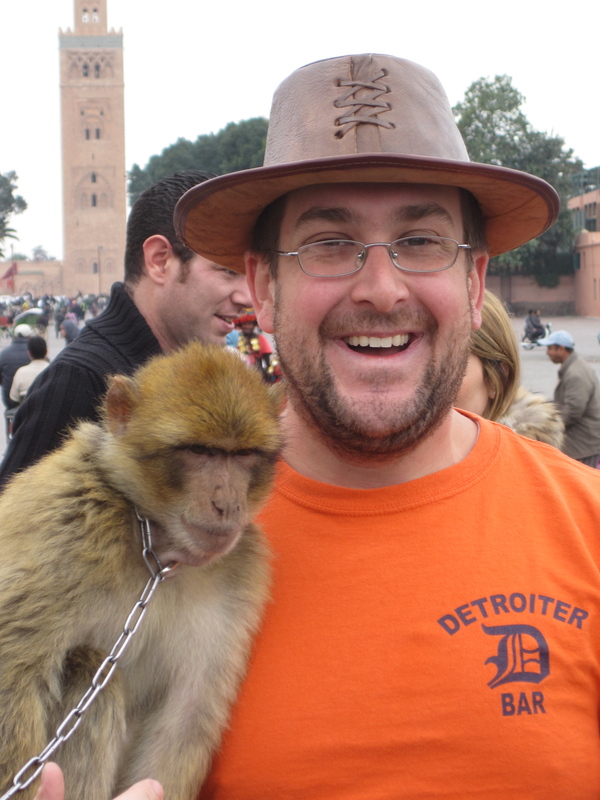 You take a couple pictures with said animal, and then pay the guy ten dihram so that he doesn’t tell the animal to rip your eyes out. I got lucky; Danny had a giant snake thrown onto his shoulders, which would have ruined my jeans and given me nightmares for a few months. I had seen shows about this and was extremely excited for the tremendous amount of new eating experiences that I would be able to choose from. Right after we arrived the first night, I hit one of the many snail stalls. 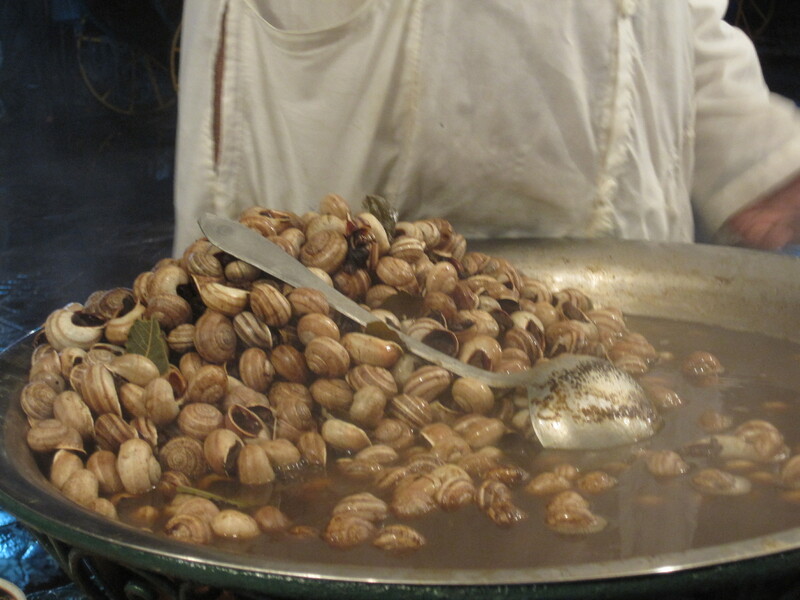 The cooking liquid is loaded with spices and bay leaves and has a flavor that mixes shellfish saltiness with sweet and spicy. 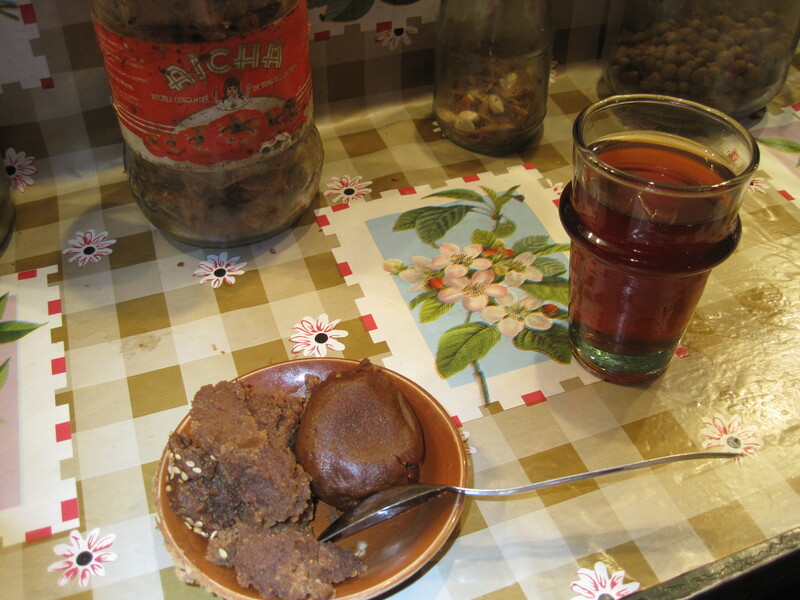 The broth is considered to have medicinal qualities and many people pay one dihram for a bowl of just liquid. I went for the 5 dihram small bowl of snails. 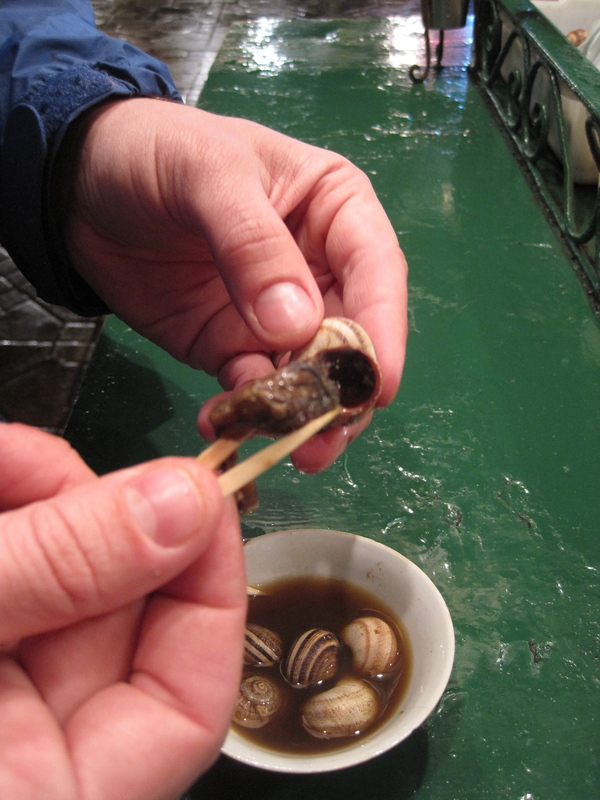 The snails were very tender and had good flavor. Considering that a small bowl had 12 of them, I can’t imagine eating a large bowl which was more than double the size for 10 dihram. If you like french-style escargot, you might not like this since it doesn’t have the butter and garlic that makes escargot great. However, it is a good reference point that 12 snails cost about 60 cents vs. the $15 you’d pay for 6 in a French restaurant. Also, no allergic reaction, guess that allergy might have gone away. We ate dinner at a funny nightclub that featured people dressed like sailors and Michael Jackson impersonators that sounded out the lyrics to entire songs. First odd item of the following day was this fruit. The guy on the far right would cut into the hard outer shell and pop out a round ball that looked like, and had the staining potential of, a cooked beet. It also had the texture of a cooked beet with a couple small seeds and a mild sweet and sour flavor. If you know what that fruit is, please comment. After walking around for about 6 hours and heading back to the hotel to shower and take naps, we were ready to hit the square for dinner. The previous night I saw one particular food item that really scared me but seemed like a unique experience. My apologies to the squeamish, but I was looking forward to trying sheep’s brains. 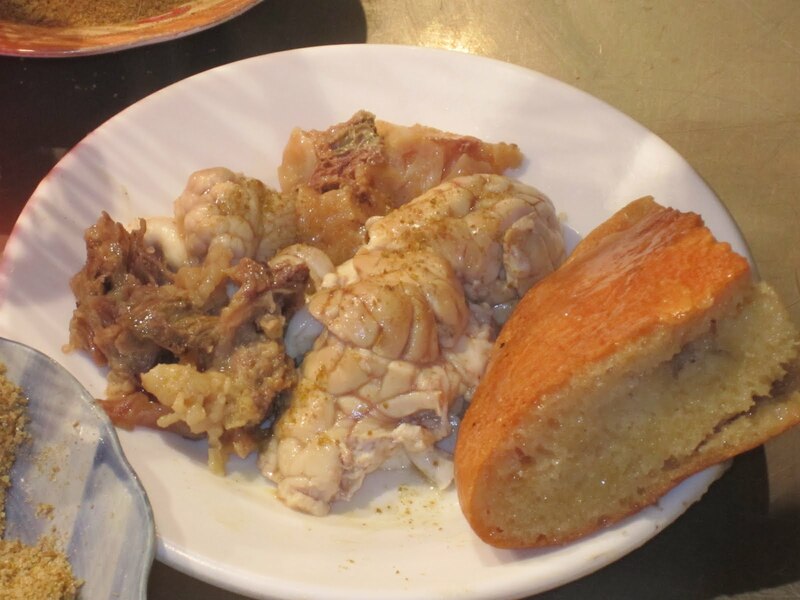 I ordered and watched as they quickly poached the brains, cut them, and put them on a plate with some cheek meat from the sheeps head (just to the right of the brains in the picture). 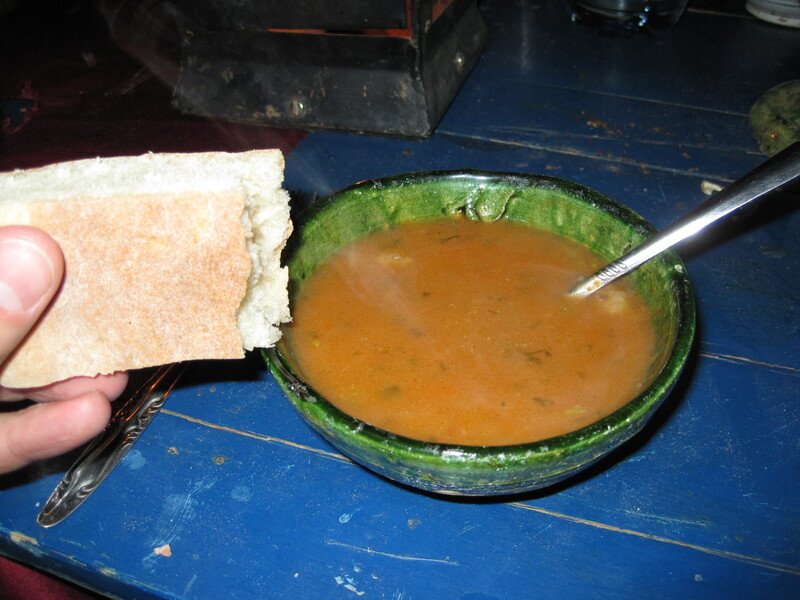 They added a piece of bread dipped into the poaching liquid as well. The first bite didn’t go so well. I ate it completely unadorned and as I was chewing/getting an idea of the texture I started thinking a little too hard about what I was eating. The texture is creamy, and the flavor is mildly lamb-like and livery. I had to take a little pause, eat some cheek meat and drink some water. The next bite was much better and led me to take several more, since I figured out the importance of a sprinkle of cumin salt and wrapping in a piece of dry bread. The dipped bread was really the funkiest part. It tasted fine, but stuck to my fingers and teeth and anything that came into contact with it. Time to move on. We headed over to stall #1 which was by far the most packed and is noted on travel sites as having the best food on the square. 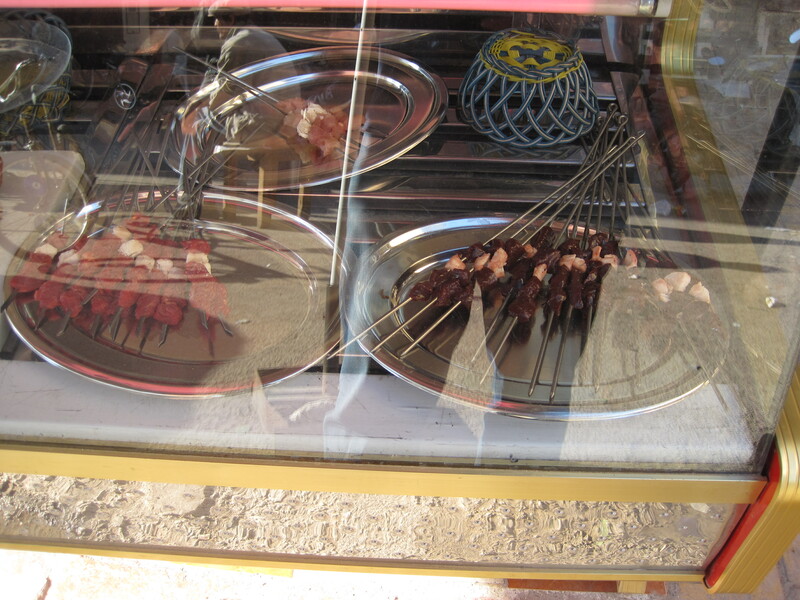 You pick your meat or side dishes and they grab a few skewers and throw them onto the grill. The eggplant and grilled sweet potato balls were really awesome, and all of the meat was fresh and had nice flavor. 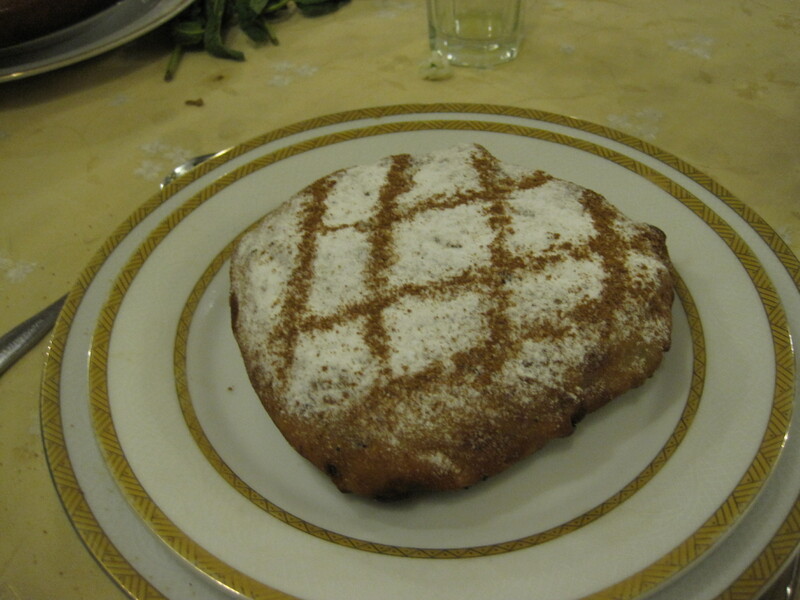 The cake has a pleasantly mealy texture (if that’s possible) and tasted like it was entirely made of cinnamon. The tea was very heavily spiced, almost to the point of being spicy. Each of these on their own wasn’t that great, but when you took a bite of the cake followed by a sip of the tea, it was actually pretty tasty and unique. If you are somehow still reading this post, I will wrap it up with one last meal that also happened to be our best. On the last day, we finally found an alley that is nicknamed Meshwi alley and arrived right at noon when they opened up. 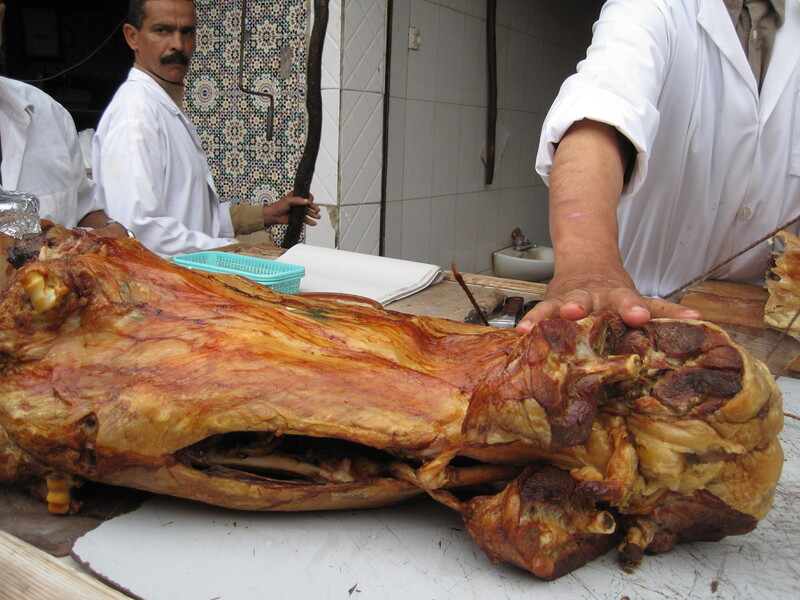 Meshwi is lamb that is hung vertically in an underground clay oven to cook whole. Just as we arrived, the first lamb of the day hit the table. 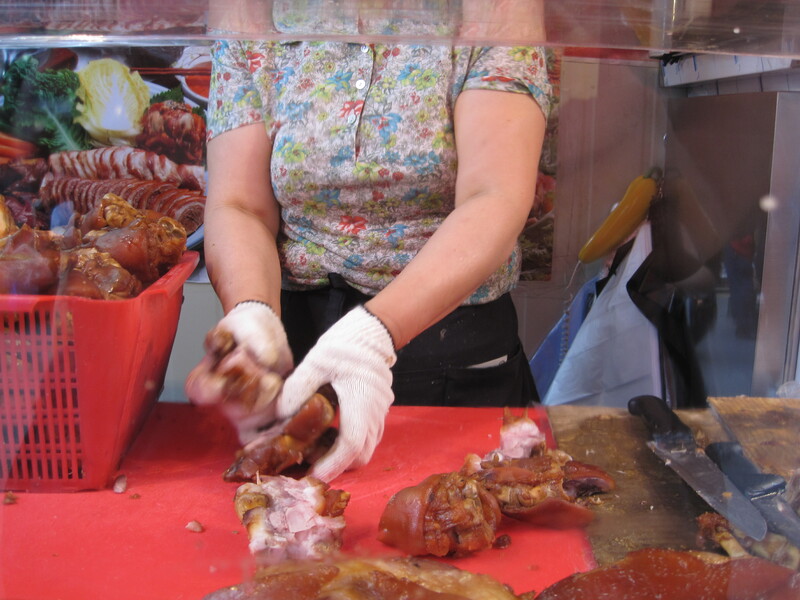 As we stepped up, the cook took a couple small crispy pieces from the shoulder and gave them to each of us to sample. A truly ridiculous piece of food. Crispy and salty outside and incredibly tender inside. 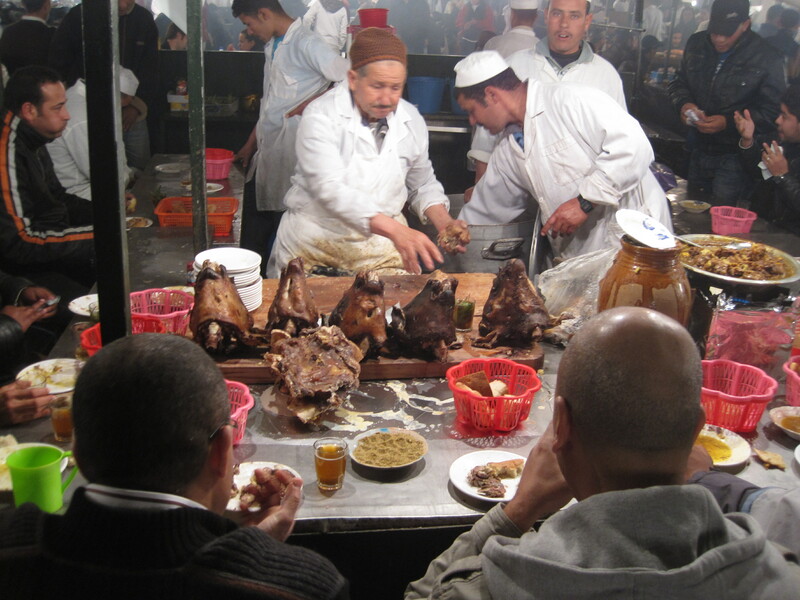 We ordered a half kilo which he took from all areas of the lamb and lead us to a table behind the stall where we could sit and eat. 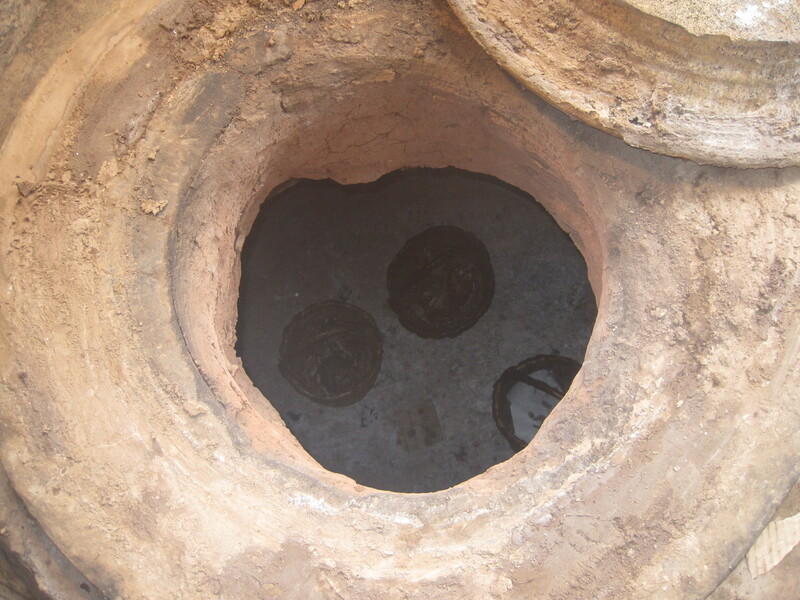 As we walked to the table, we stepped over the lid to the underground clay oven. The cook was nice enough to take the lid off and show us the inside. Right as we finished up our meal, the butcher showed up with a fresh lamb that he prepared for cooking. I was completely mesmerized by how quickly and precisely this guy worked. 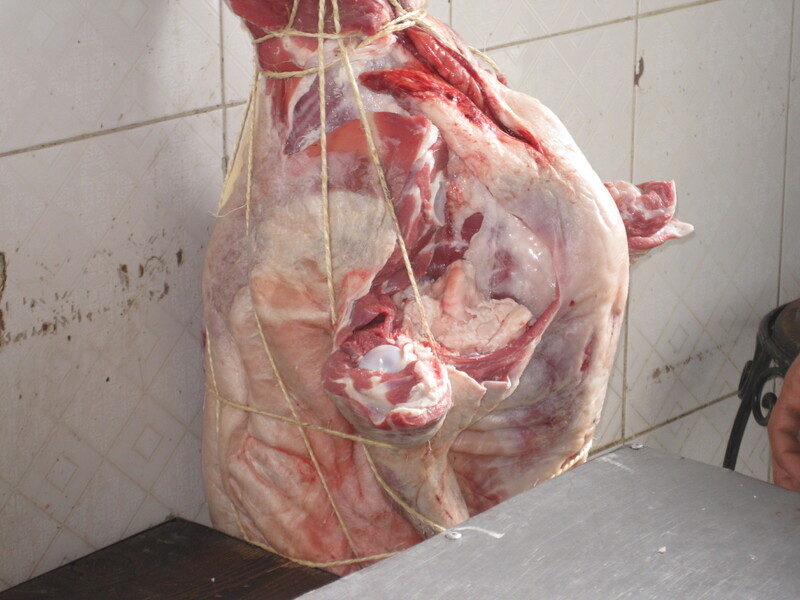 As he finished binding the lamb around the metal hook that it would hang from in the oven, he cut two slits at the shoulder joints and stuffed balls of fat into both openings. Explains how the meat stays moist throughout cooking. And that was it. We went to a fantasia show for dinner (think Moroccan Medieval Times) and then I boarded a plane for home the next morning. Sorry for the long post, wanted to give some context along the way by showing what we did and there was a lot of amazing food to cover. Will be back to cooking my own food for next week’s post. In Long Beach Island, we’ve had a conch shell as a “decoration” for as long as I can remember. As a kid I would stick my ear against it and listen to the ocean, or at least thats what I was told I was listening to. I was completely unaware how much better they taste than they sound. 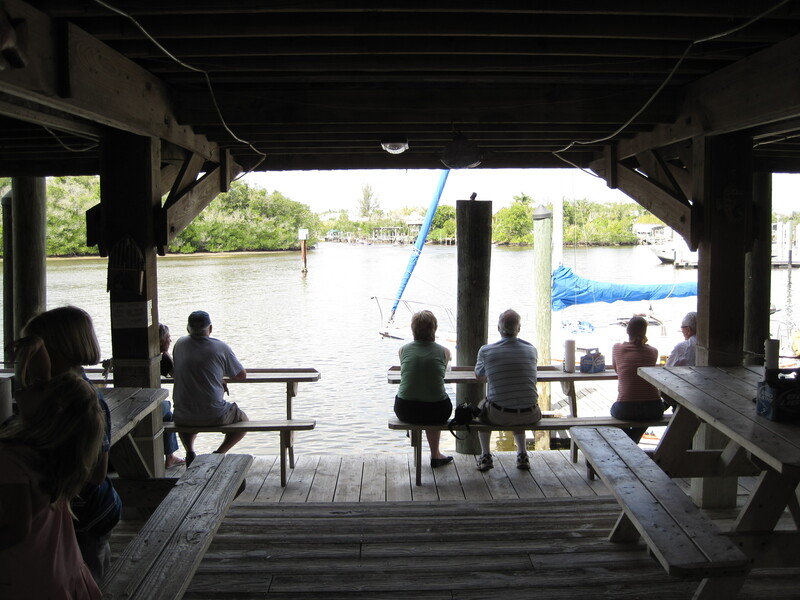 At some point in my teens, I tasted conch for the first time at The Crab Pot, a now defunct restaurant in West Palm Beach, FL. 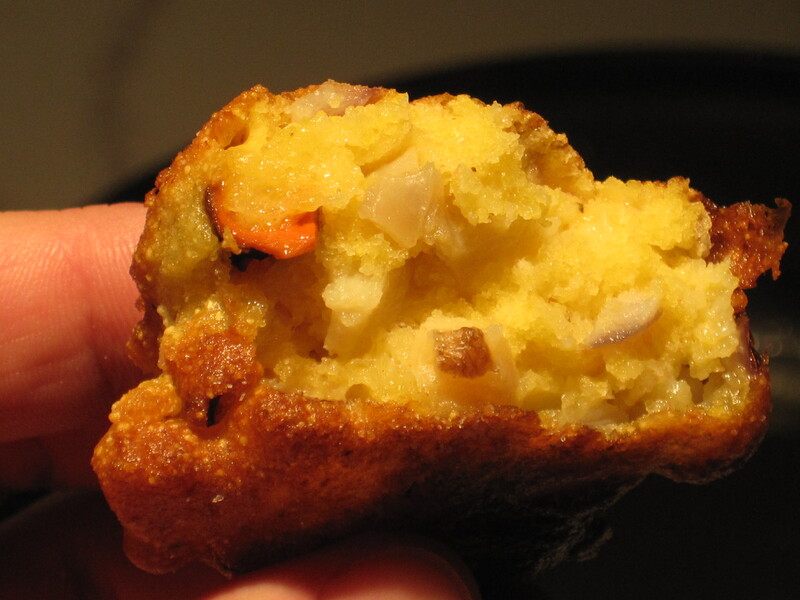 It was in the form of a fritter, and I was immediately hooked. Little fried balls of dough with chewy, flavorful chunks of conch mixed in; kind of like a Caribbean version of takoyaki. I order them whenever I see them on a menu, which is quite often now that Mommy Ryan has moved to Naples. Kristi, Tim, and I visited her this past weekend and I finally had a chance to cook my own version of one of my favorite foods. 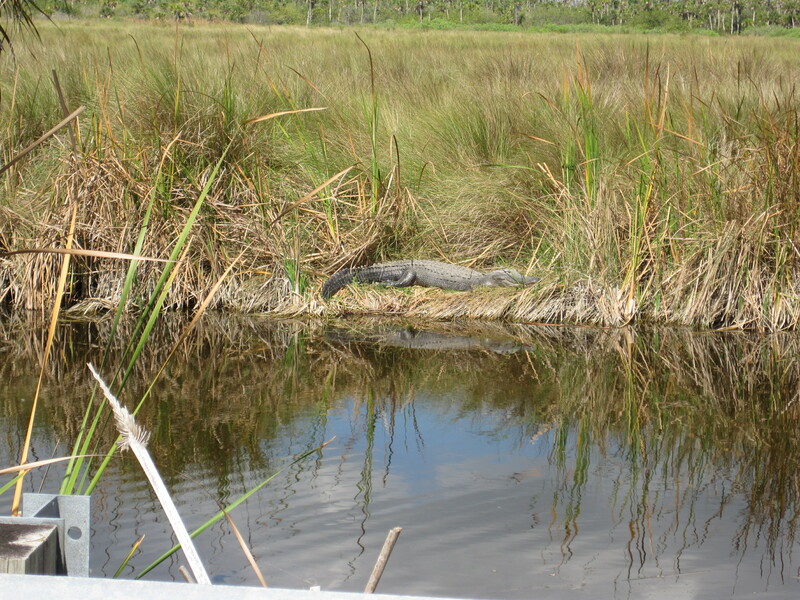 On Saturday morning, Tim and I drove down to Everglade City to check it out. Mom had been before and Kristi had no interest due to the presence of alligators, which I mocked her about. Then we drove down there and I had to lift my feet off the floor of the car in terror when I saw sights like this out the window. Tim and I had two goals: buy a bunch of stone crab claws at a seafood market Tim had visited previously and find a place that serves up authentic Everglades seafood for lunch. I had one additional goal: find something to cook that I could use in a blog post. After visiting 3 or 4 restaurants and coming up with excuses to leave after seeing the menu (example: “its kind of chilly out here, I think we’re going to head to the inside dining room” then bolting for the car), we discovered City Seafood. You wait in line, order your food, grab a beer out of the ice chest, then anxiously wait for them to call your number. It reminded me of all of my favorite shellfish places in New England and LBI. Al fresco dining and swamps don’t usually go together, but it was a surprisingly pleasant view and had none of the mosquitos I expected. Also, I was extremely excited to try two items I had never seen on a menu before: fried whole cracked conch and grouper cheek sliders. 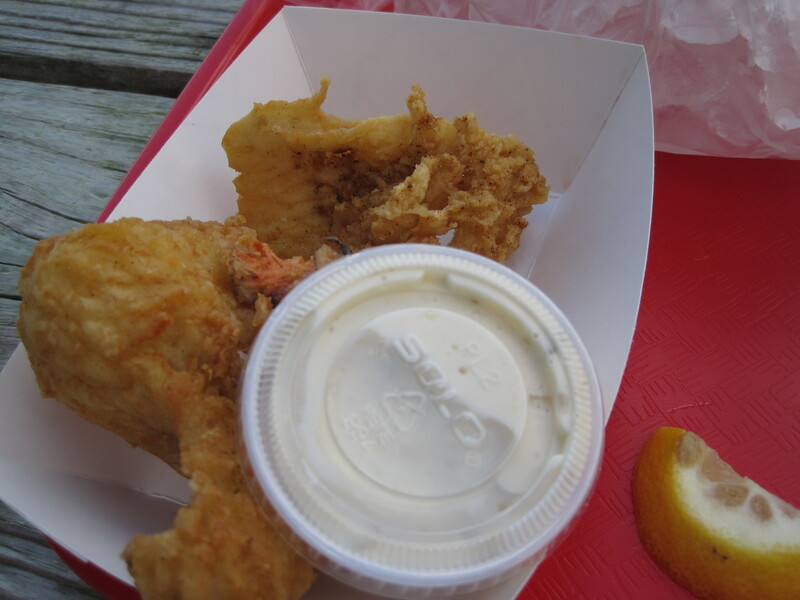 The fried conch is basically everything that comes out of the shell except for a couple inedible parts. 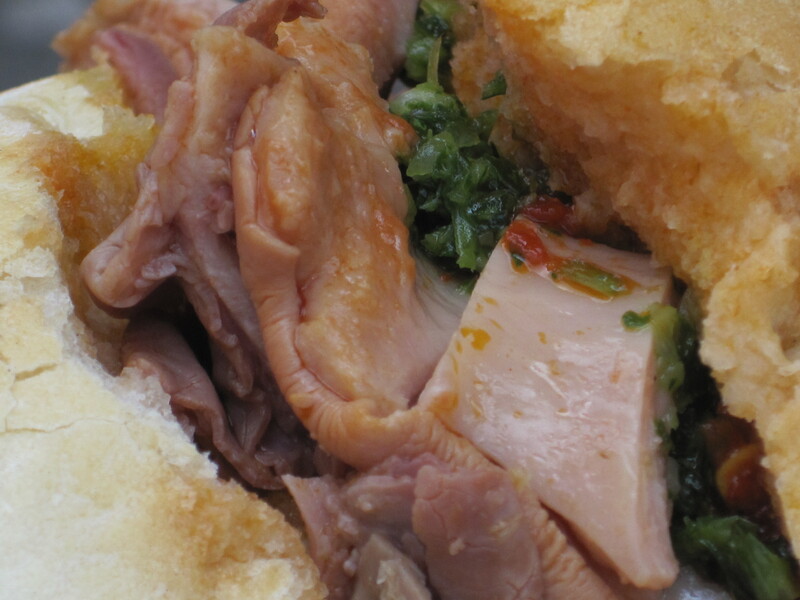 Its quite chewy, but the flavor is great; very similar to the belly portion of whole fried clam bellies. A seen in the fishing post, grouper have large flat heads with decent sized cheeks and each slider had four. Much like other cheeks I’ve tried, they were moist and tender. Tons of grouper flavor and very fresh. I haven’t included any pictures of the stuff Tim ordered because it was boring. 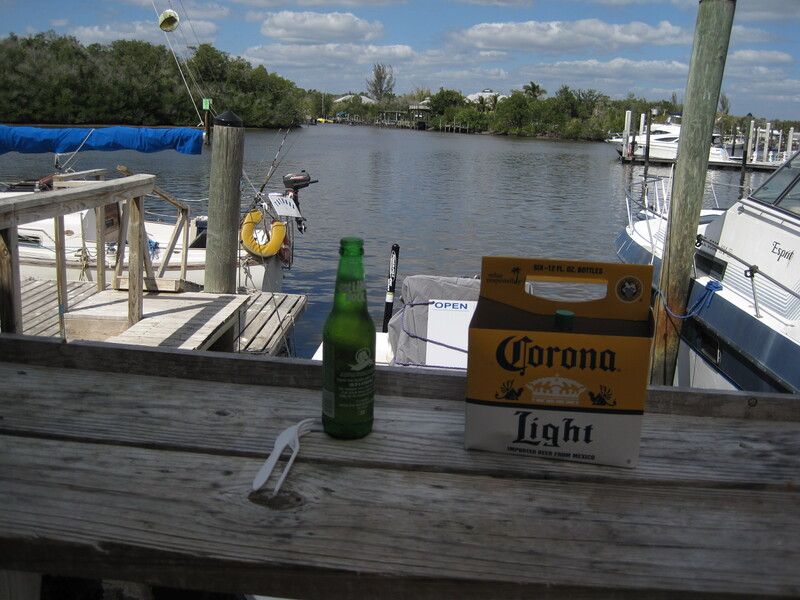 After lunch, we visited Grimm’s Stone Crab to pick up a couple pounds for an appetizer that night. Upon arrival, I discovered they also sold raw conch meat and my goals for the road trip were officially accomplished. We bought half a pound of frozen conch meat and headed back to Naples. 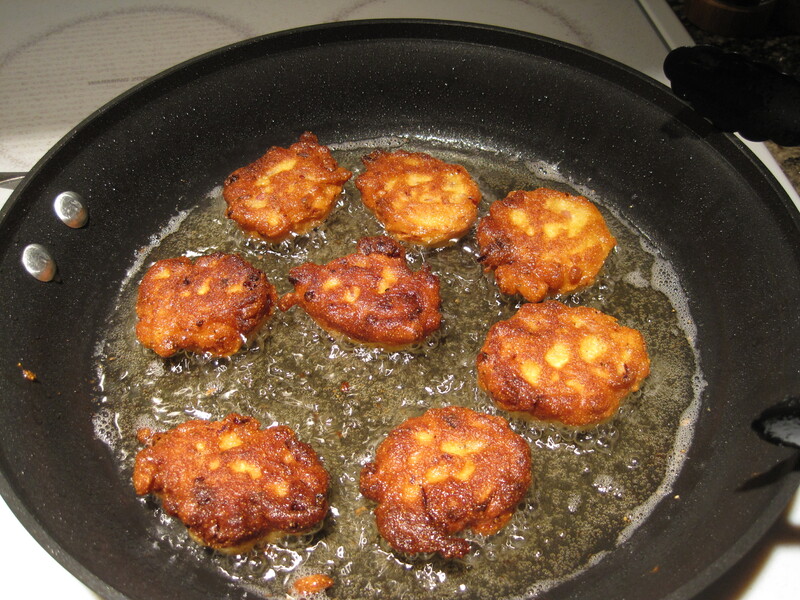 The following afternoon, I decided to make an attempt at homemade conch fritters. 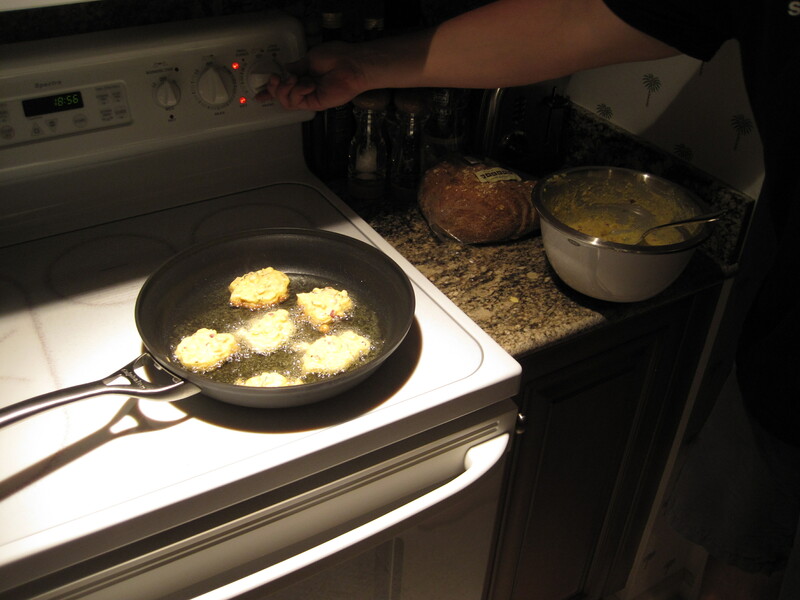 I had a few things going against me, mainly that I didn’t want to go through the process of deep frying the fritters and that I refused to look at a conch fritter recipe. 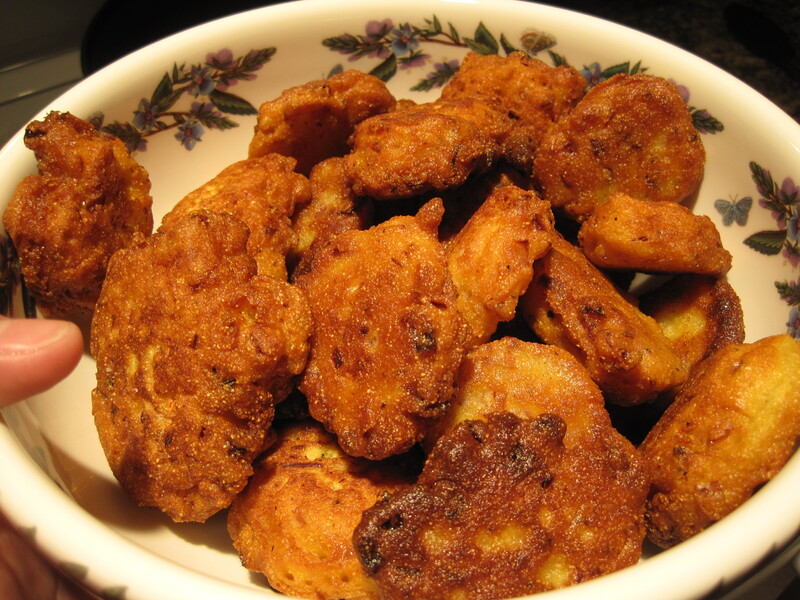 So, I decided to make a basic hush puppy batter, mix in the conch and other additions and pan fry them. 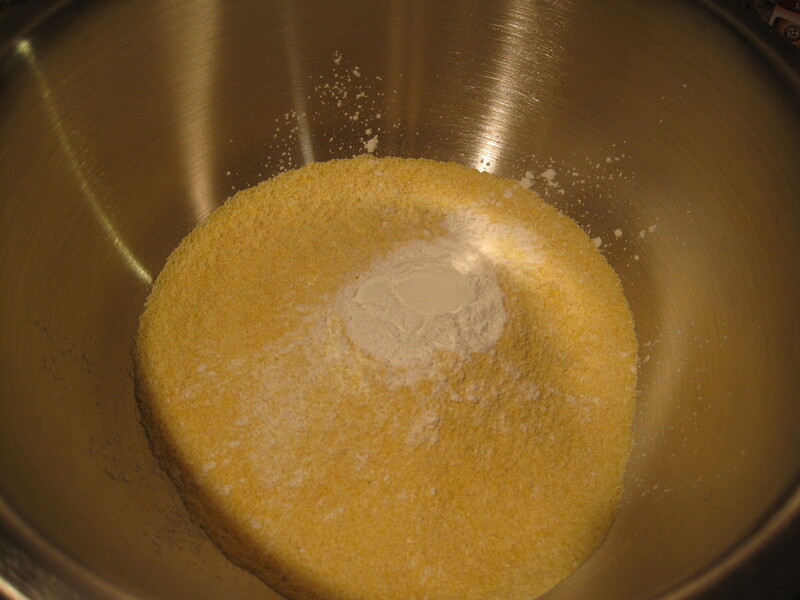 The batter started out simply with corn meal, flour, and baking powder. 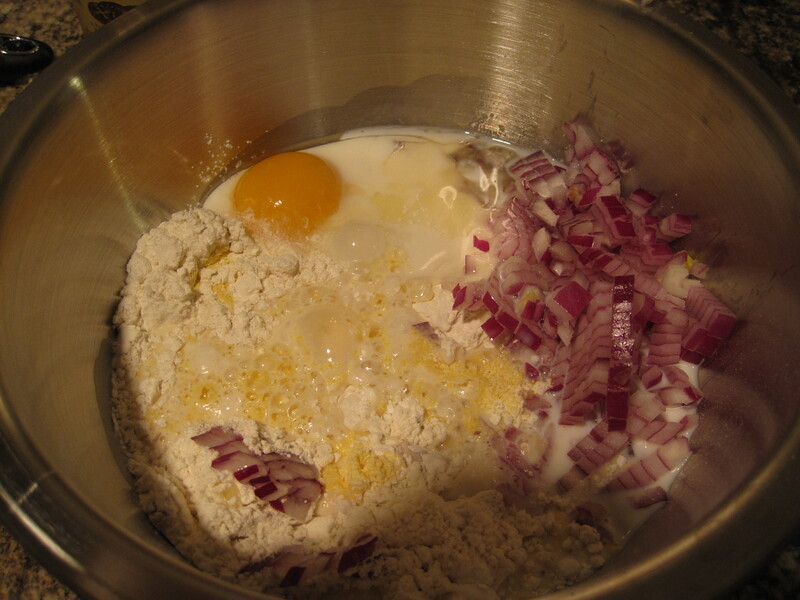 Threw in an egg, milk, salt, and half a diced red onion. With that ready to go, I pulled the conch out of the fridge to cut it up and add to the batter. The white parts are where all the flavor is, but the colored areas are just a thin membrane that covers the meat. Its all edible, so I didn’t try to do any elaborate butchering, just chopped the meat up into small cubes and added it to the batter. After a few shakes from a bottle of Cholula, some lemon juice and black pepper, I whisked the batter a little more then let it rest while I heated olive oil in a pan. The first batch was a test batch. I dropped varying sized spoonfuls of batter into the hot oil to A) see how the fritters taste and B) see how big the fritters should “B”. Wokka wokka. After tasting the first batch, we decided the batter was definitely under seasoned. The meat to dough ratio wasn’t out of whack with what I’ve had in restaurants, but the dough was lacking a complimentary shellfish flavor. I added more seasoning, but noted that in the future I should replace some of the milk used in the batter with clam juice or fish stock. Once the seasoning was as good as it would be, I cooked the remainder of the fritter batter. I was a lot better at judging when these were golden brown than I was with the fish cakes. We kept the early batches warm in the oven while everything cooked and eventually ended up with quite a large bowl full of fritters. We served them with some sauce options: tartar sauce (made with dill pickles, the obvious best way), cocktail sauce, and the stone crab mustard sauce I mentioned earlier. I thought they were delicious, though definitely different than the restaurant variety. I really enjoyed the fritters, there were just a lot of them. The sweetness of the corn meal worked well with the shellfish and the cocktail sauce in particular matched up really well with the taste. 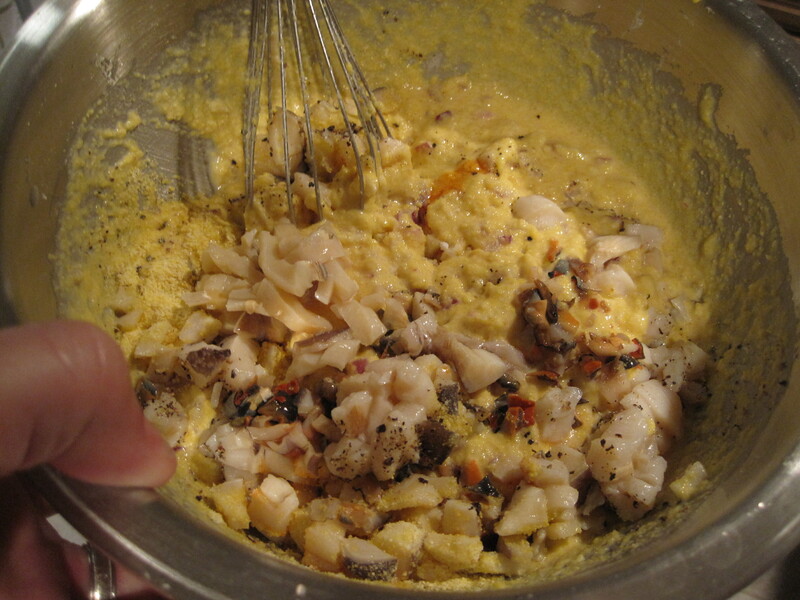 If I did it again I would make the same amount of batter (with some seafood stock mixed in) but probably add three quarters of a pound of conch. I’d also like to make these again with other types of shellfish and can’t wait until I am at somebody else’s house to try a bay scallop and shrimp version. More indecision about next week’s entry. Will have to hit the Italian market this weekend. 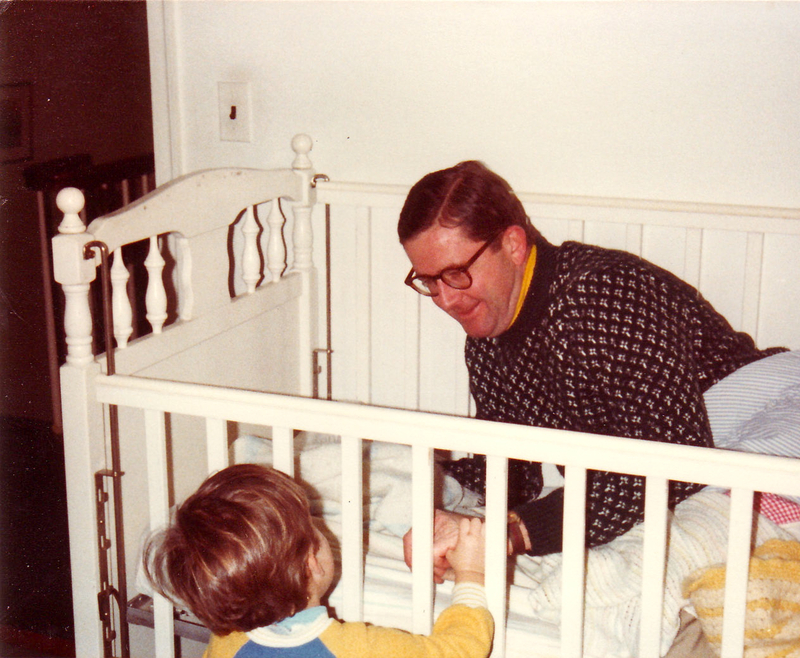 One year ago today, my father passed away peacefully at the age of 67. I figured a good way to remember him would be to make his favorite dinner and recap the process along with a few anecdotes about him. First, if you asked Dad what his favorite food was, he’d probably take some time to think about it, scribble some stuff down on the back of an envelope, and then come back with something completely random. The last two times I asked, he responded with Cassoulet once and Coq au Vin once, two foods I never saw him consume in my life. However, any time we were meal planning for a week and asking for suggestions, he would request fish cakes and spaghetti be added to the list. 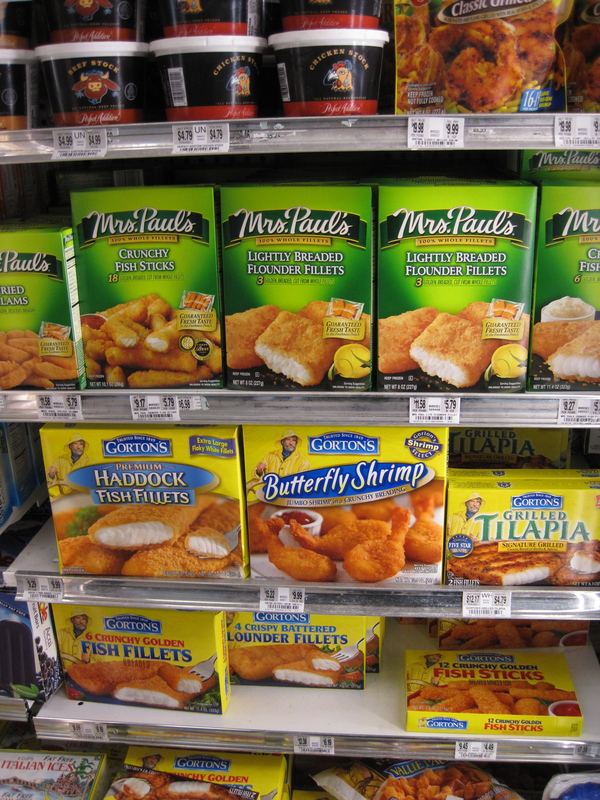 Now, if Dad was reading this he would be grunting, groaning and protesting that fish cakes are not his favorite food. He would also likely be wearing this hat and pointing to it a lot. Despite those expected protests, you can’t argue with how much he enjoyed fish cakes and how often he requested them. 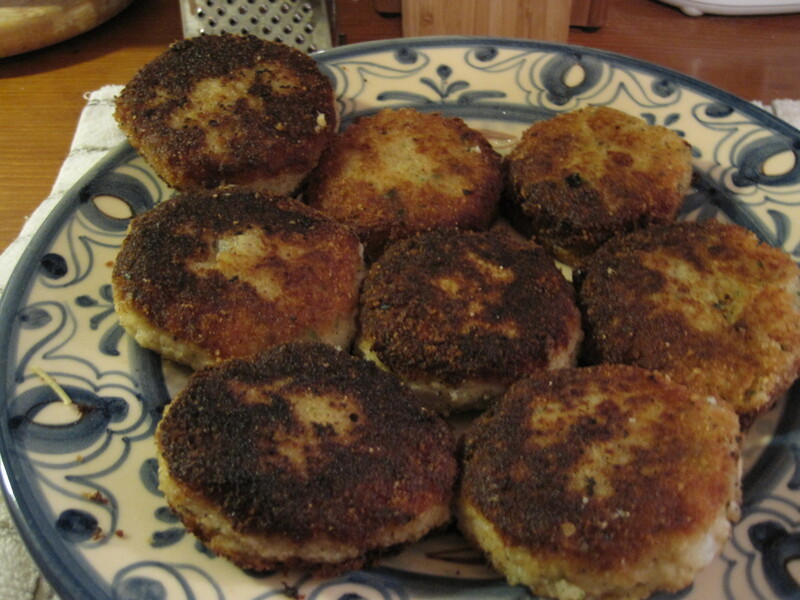 For those unfamiliar with fish cakes, they are a pasty combination of anonymous fish and rehydrated potato that Mrs. Paul cooks herself and places in the freezer section at your local grocer. Anyway, fish cakes served with a couple boxes of spaghetti and a jar of Ragu was a regular meal in the Ryan family’s informal biweekly meal rotation. My goal, with my brother Tim’s help (of course), was to recreate the meal from scratch and hopefully improve upon it while keeping it authentic. 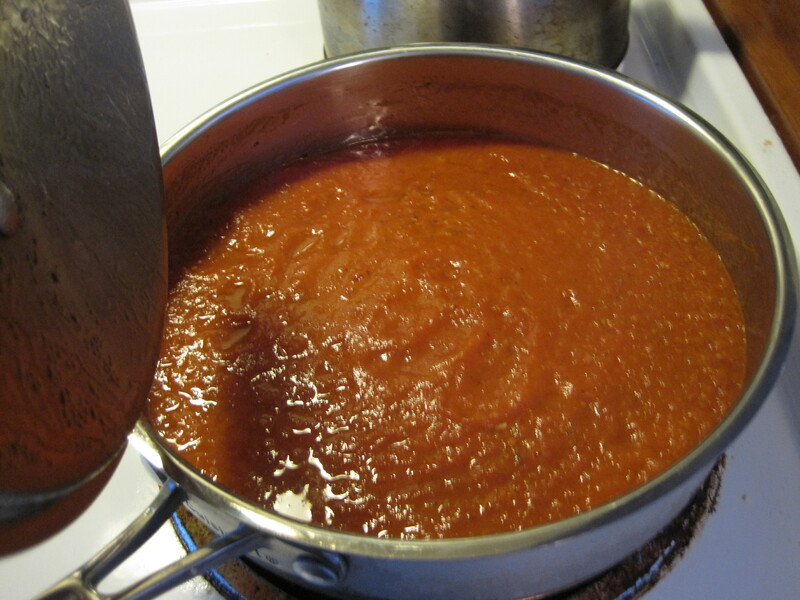 When I arrived at Tim’s house, his homemade marinara had been simmering for a few hours over low heat. 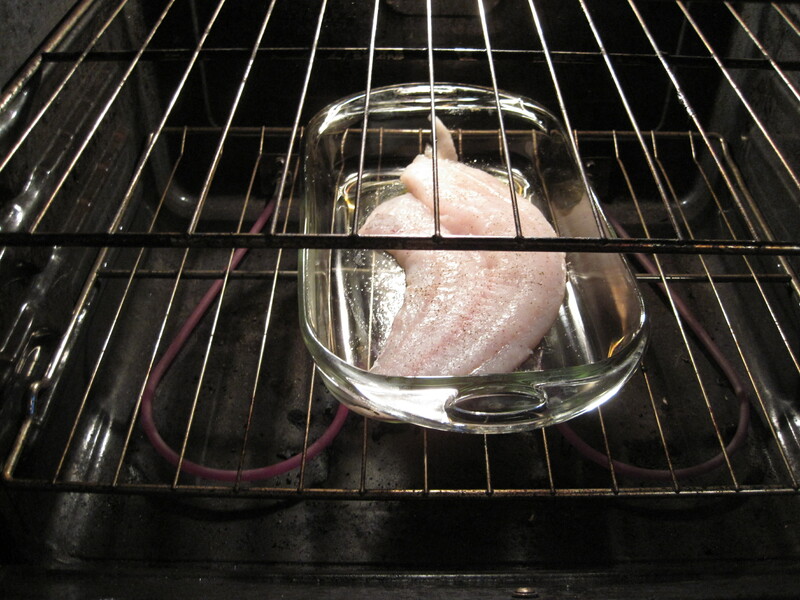 I started a pot of water boiling and put a one pound fillet of cod, seasoned with a little salt and pepper, in the oven for ten minutes. This list does a good job of clarifying an earlier comment; Dad loved food, but he really didn’t have the patience for cooking it. I thank my mom for my love of cooking but Dad gets credit for my adventurous tastes and willingness to try new foods. When I asked him why he liked all of those crazy items, he told me that when he lived on diners and delis in NYC, whenever he saw something he hadn’t tried, he ordered it. So that’s where I get that trait from. Back to the cooking. 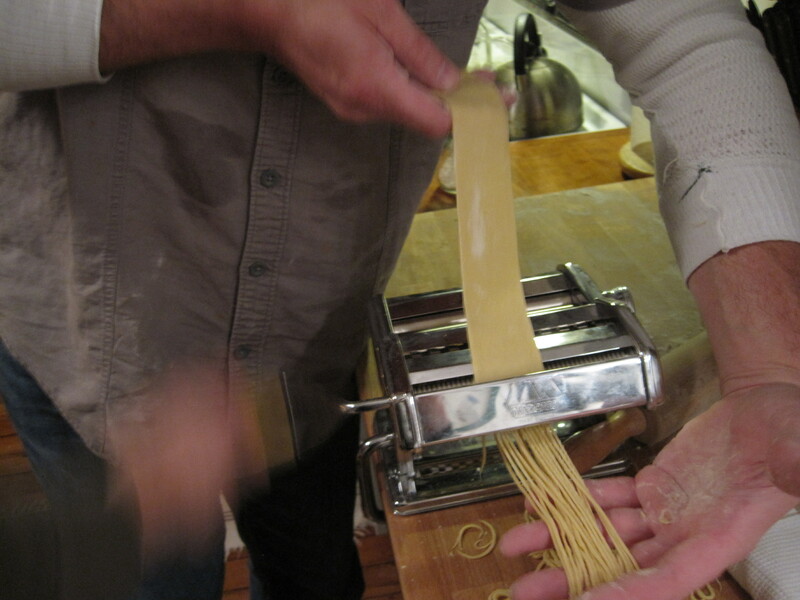 Tim planned on making the pasta using the hand-cranked pasta maker that we got my mom for Christmas 20 years ago, likely from Woolworths in Bernardsville. Needless to say, it is low quality and may have been used twice before Mommy Ryan realized the hell of cooking for five people when it takes 20 minutes to make one serving of pasta. 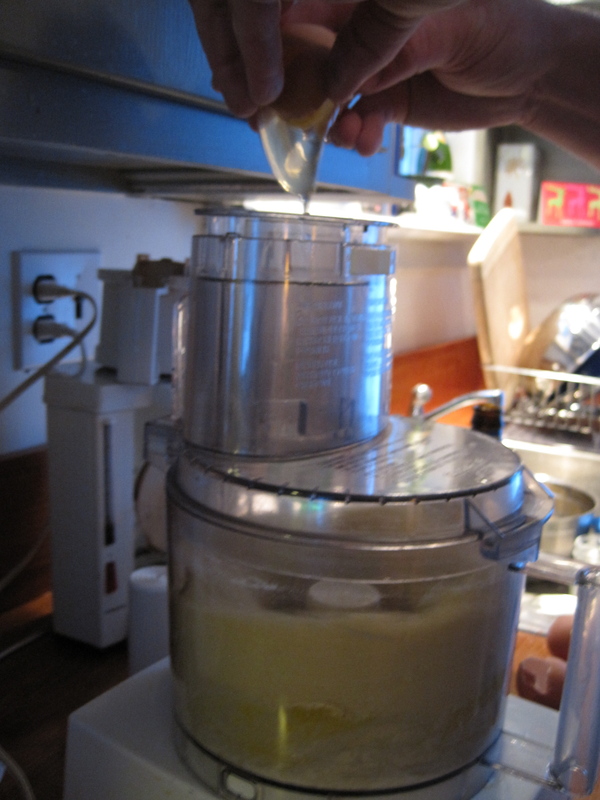 Tim started out by combining the flour and eggs in a food processor. 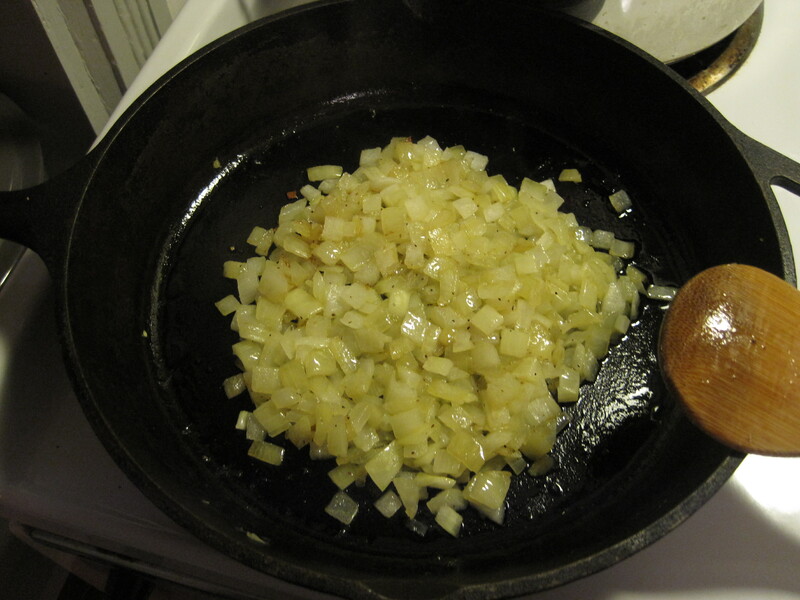 While Tim made the pasta dough, I sauteed a large chopped yellow onion and boiled three peeled russet potatoes. The pasta dough rested for about 40 minutes while the potatoes boiled simultaneously. Sounds like a good window for more Jack Ryan stories. 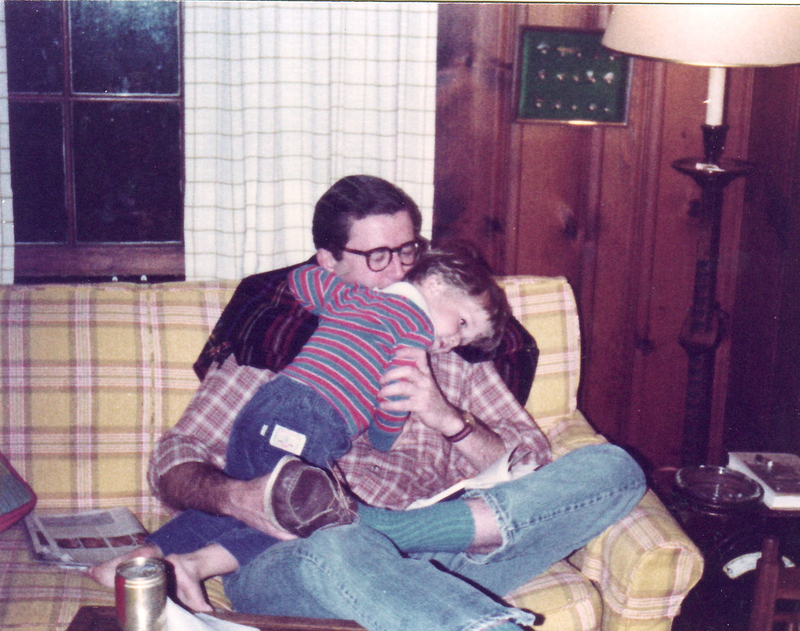 When I was 22 and living at home after college, Dad and I had a night where we needed to fend for ourselves for dinner. Dad went with his go-to, corned beef hash and eggs (or “dog food for people”, as he called it) while I made a sandwich or something. I watched him walk into the kitchen, drop the can full of hash into a hot pan, crack an egg on top, and walk away. For twenty minutes. Being the know-it-all that I am, I told him there was no way it would cook like that and he’d end up with raw eggs and canned food. Instead, he ended up with crispy hash and a fully cooked, steamed egg on top. He was nice enough to not rub it in my face after it came out perfect. 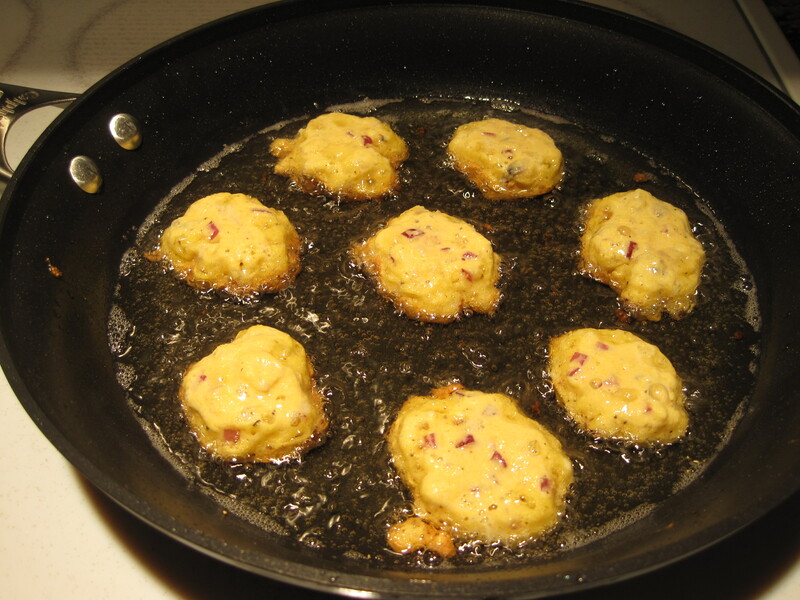 Let’s check back in on the fish cakes progress. We boiled the potatoes a little longer than normal because we were looking for a texture that was a little more glue-like. Butter, salt, pepper. Write that down. 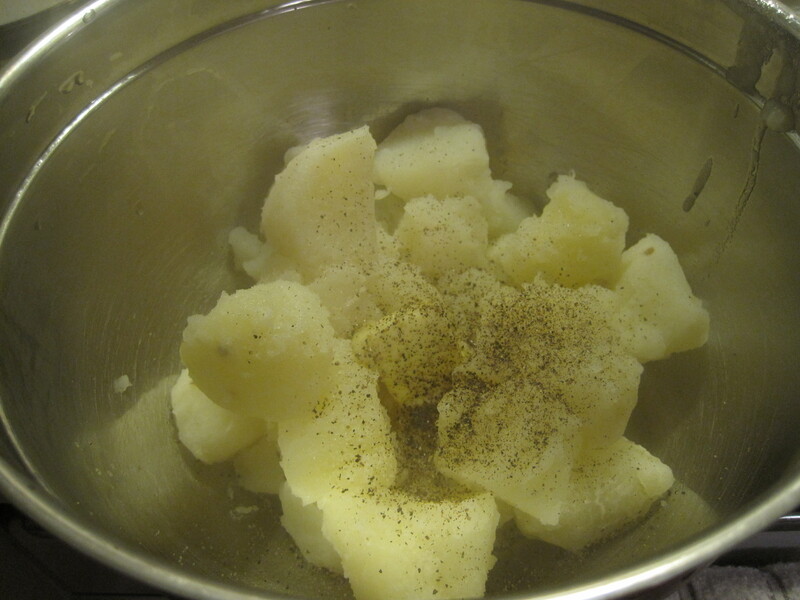 I mashed the potatoes using salt, pepper, butter, and the liquid from the dish the cod cooked in. 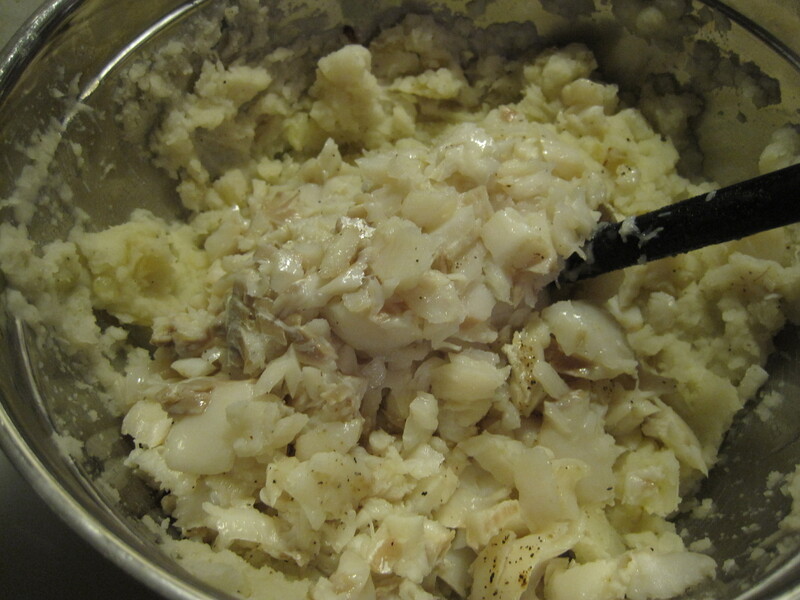 Once they were smooth and creamy, I added the sauteed onions and cod and mashed the mixture up some more. Once it was fully mixed, I put the bowl outside to cool and helped Tim with the pasta rolling. 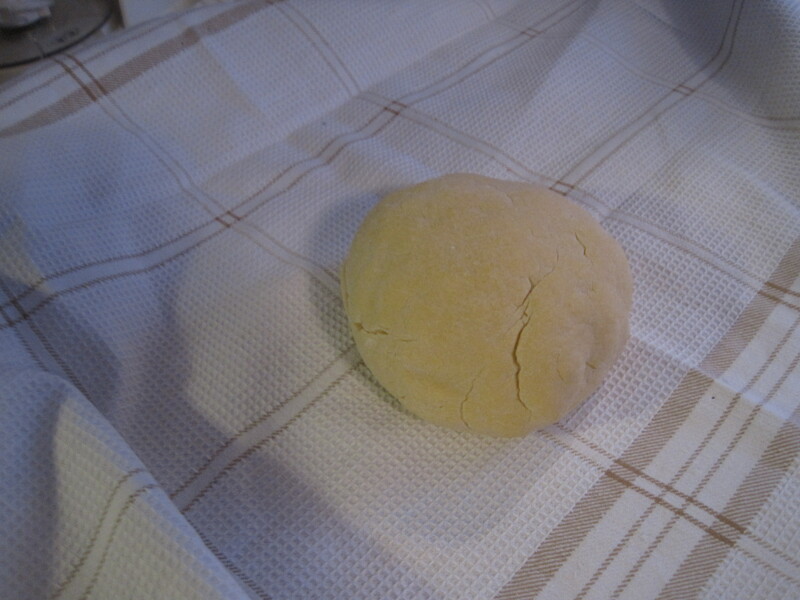 The dough ball was split into five portions and then run through the roller multiple times, folding the dough back on itself after each time through. I have no understanding of why this was necessary, and neither did Tim, but it’s supposedly how it’s done. Once the dough was rolled into a long, flat uniform piece, we ran it through the cutter. 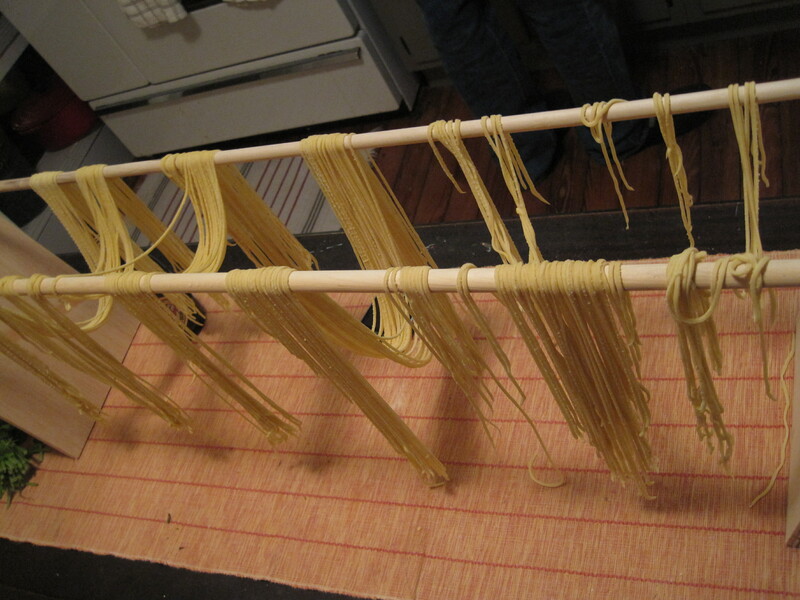 At which point the pasta was transferred to Tim’s homemade pasta-drying rack. While the pasta dries and the potato/fish mixture cools, let’s talk about Pop Ryan a bit more. I think the following two items give a good understanding of the range of his favorite foods. 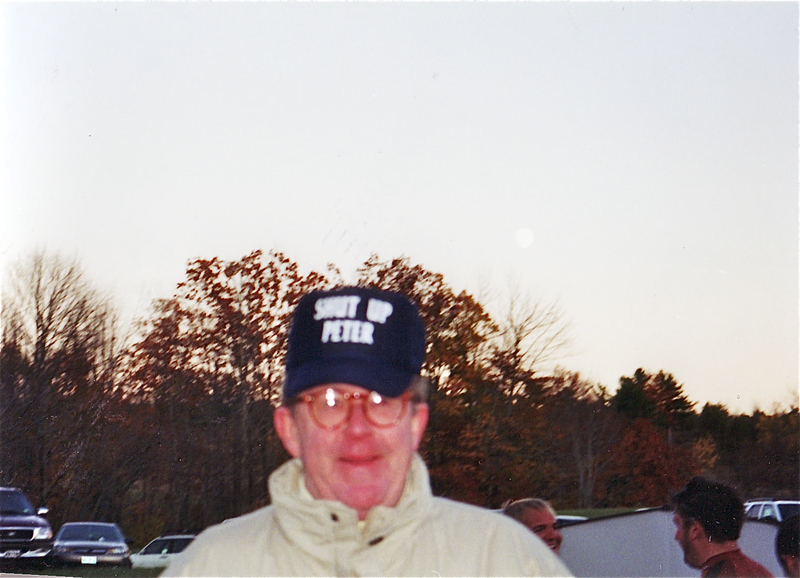 When I was 7 or 8, I was allowed to attend the Far Hills Race Meeting (or the Hunt) after a couple year break. The reasons for the break are irrelevant (when I was 5, I “washed” my hands with a urinal cake thinking it was soap in the porta potties) but upon our return we spent our time at the Caspersen’s tailgate. I don’t have many food memories from this time in my life, but Dad giving me a spoonful of caviar is forever seared in my memory. He explained to me what it was in advance and I think he expected me to be grossed out. But once he saw that I was intrigued by it, he told me how special and expensive it was and then gave me a lump of it. I loved it then and still love it now. Every time I have a chance to eat great caviar I am immediately reminded of the first time I had it and remember it fondly. Pickle and cheese: dill pickles, sliced thin and served on white bread with a couple slices of American cheese and a healthy slathering of mayo. Had one of these a couple weeks ago. Cream cheese and olives: sliced martini olives and cream cheese on white bread. Catching the pattern of condiments combined with kraft cheese? Sardines and mayo: referenced this one earlier. 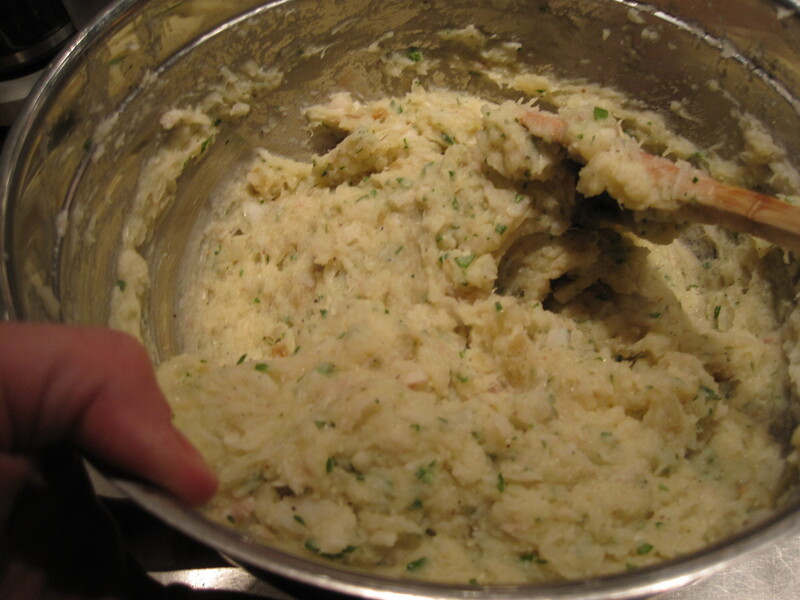 Drain a can of sardines, mash it with mayo, and serve it on a sandwich like tuna salad. Sounds gross but don’t knock this one until you’ve tried it. He taught me to love one of the most expensive foods on the planet and also sandwiches made from whatever was leftover in the fridge. I know those sandwiches wouldn’t be enjoyable for most people, but for me they are the epitome of comfort food. Once the fish, onion and potato mixture had cooled completely, I mixed in two eggs, parmesan cheese, lemon juice, fresh parsley, salt and pepper. 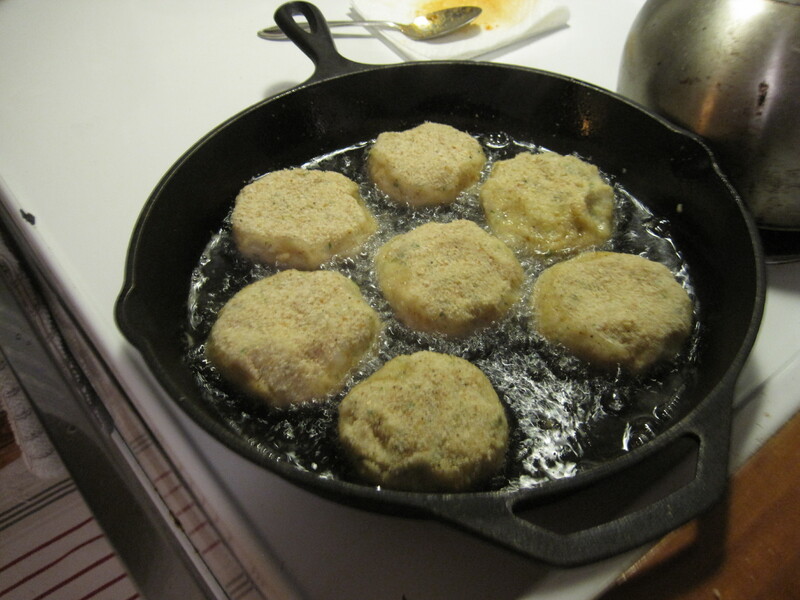 The bowl was formed into individual patties and rolled in breadcrumbs while oil heated in a pan on the stovetop. These went into the pan for a few minutes on each side. Before we eat, one last Jack Ryan story. One of my favorites. Dad: You guys don’t seem to have your act together, can we get some menus and order? Owner: I don’t know what I can do for you. My staff quit and I have nobody to cook. Dad: If you need a cook, get me an apron. Dad stood up from the table, grabbed an apron, walked to the empty cooking area and started calling out orders off the tickets above griddle. I sh*t you not. I am struggling to write this right now because all I wish is that I could remember and explain this as perfectly as possible. But I was just a mortified 11-year old; I didn’t know how much I would treasure this memory at the time. When he felt like he had things well in hand, he took off the apron, returned to the table, and we left the diner to go elsewhere for breakfast. I remember thinking how happy he looked; it had always been a “life without responsibility” dream of his to be a short order cook. I wish I remembered it better. 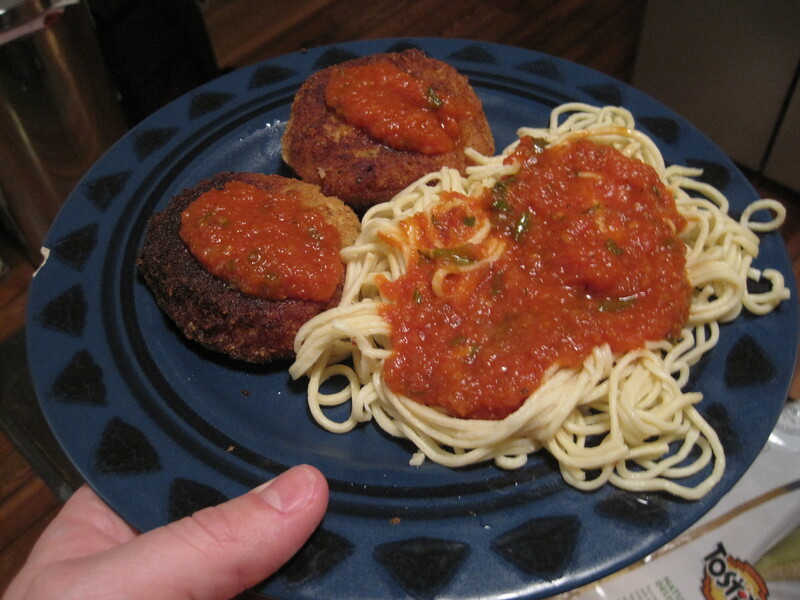 The flavor and texture of the marinara sauce was fantastic, and I am usually not a big meat-free marinara fan. 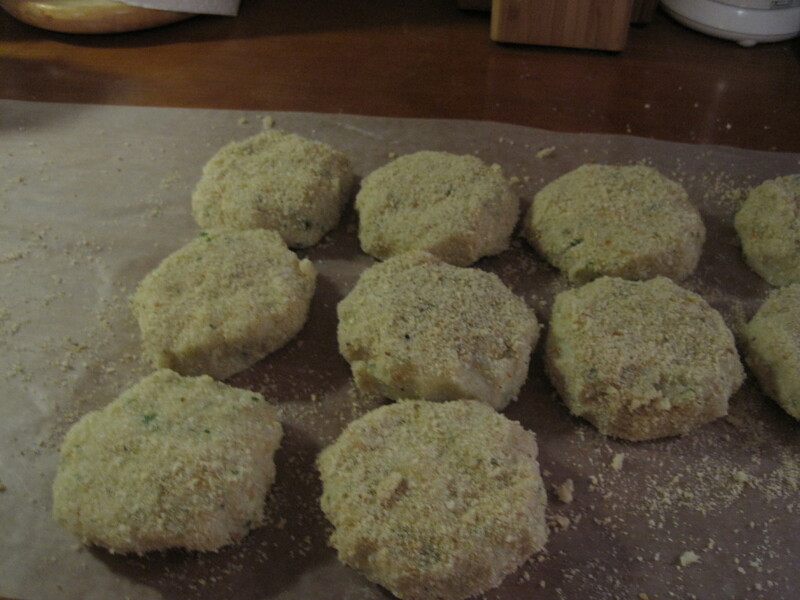 The fish cakes were pretty potato-heavy, but so are the frozen ones. These had a lot of good flavor from the fish liquid, onions, and seasoning. Overall, a very good meal and a nice low-key way to keep Dad in our thoughts. I’m guessing we will cook it again. One of the toughest parts of losing a parent is that you become more conscious of the things you learned from them after they are gone. You think of them all the time over the course of a normal day as you recognize the little things you learned from them. You wish you’d recognized all of those things earlier so you could share and thank them for it. This blog has often reminded me of my dad and the unique tastes he passed along to me. At times, it has also made me sad because I know how much he would have enjoyed reading it, emailing it to his friends and family, and eating some of the meals cooked. We all miss him a lot. 1) Trip was great, thanks for asking. We flew directly to Rome and spent two nights there, then three nights outside Siena, three nights in Cinque Terre, and two nights in Florence. 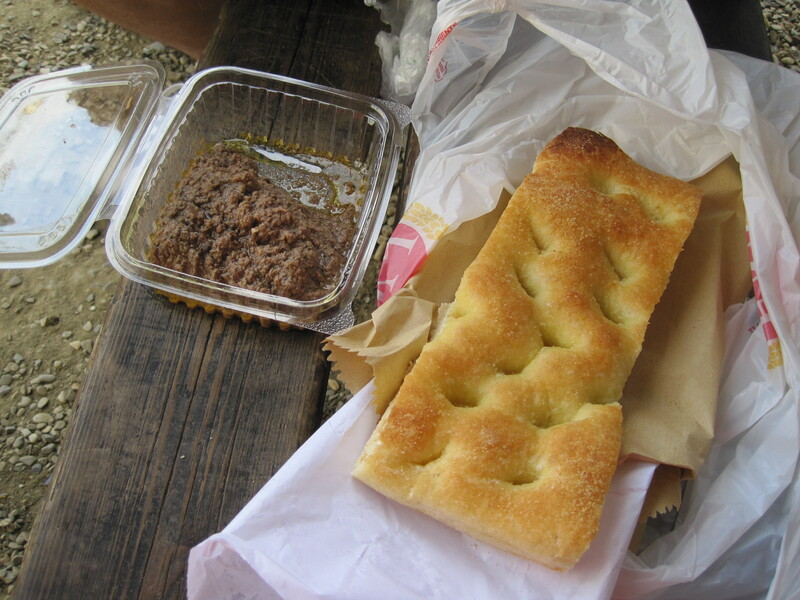 2) I don’t really consider any of the food that I ate to be that weird because they were all common food items in Italy. But they were a little different from standard U.S. fare. 3) I know nothing about music. My taste in music is similar to my general pool of knowledge; I know a little bit about a lot of things. Meaning that my itunes probably has 3,000 songs from 2,000 bands across all genres. And I like those songs, but see no need to have the whole albums. 4) I am 30 and my lifelong love affair with mixes is as strong as ever. It started with mix tapes, then mix CDs, and now we’re in the evolved world of mix “playlists”. Instead of the dates and seasons that used to serve as titles for my old mixes, I now have playlists with titles like “bachelor party”, “Tahiti”, and, my current favorite, “Hangin”. With those details out of the way, I decided to do something a little different with this blog post. After two nights in Rome, we picked up our Fiat Panda rental car and spent the next 6 days driving around the Tuscan countryside and on the coast near Cinque Terre. The radio stations were miserable, and after hearing Haddaway’s “What is Love” for the third time in 24 hours I decided to make three CDs to relieve us from the radio for the rest of the trip. A total of 55 songs fit onto those CDs, and this post will attempt to relate individual dishes I ate on the trip to a few of the songs on those CDs. Let’s give this a try. After landing in Rome at 9AM and immediately sightseeing on foot for 8 hours, we finally paused to eat something substantial. 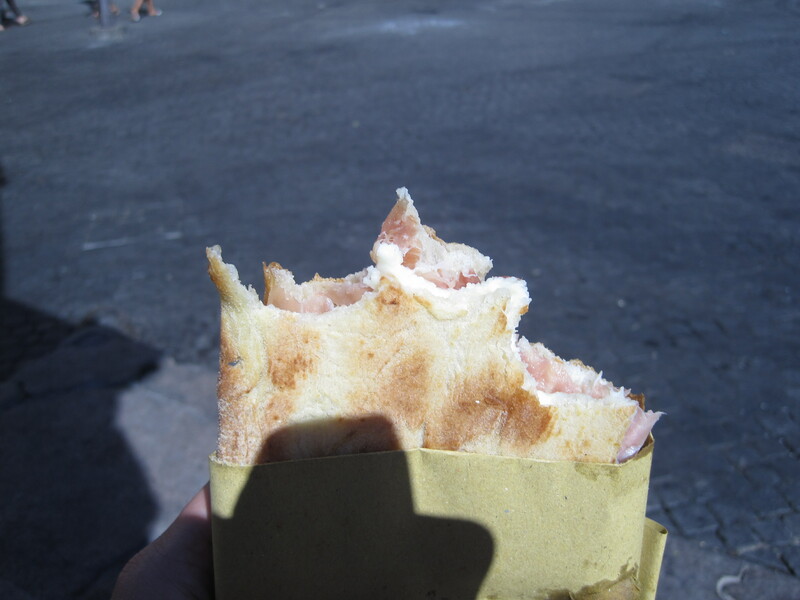 For me it was a simple, warm pizza rustica stuffed with prosciutto and fresh mozzarella. Crispy outside, salty meat, buttery cheese, and a borderline emotionally-moved DB. Definitely a pure happiness moment. No matter how many times I hear this song, it always has a knack for relaxing me and never seems to get old. Kinda like limoncello in Italy. A great way to end our first day and Rome and ensure that I would sleep well for the following 10 hours. 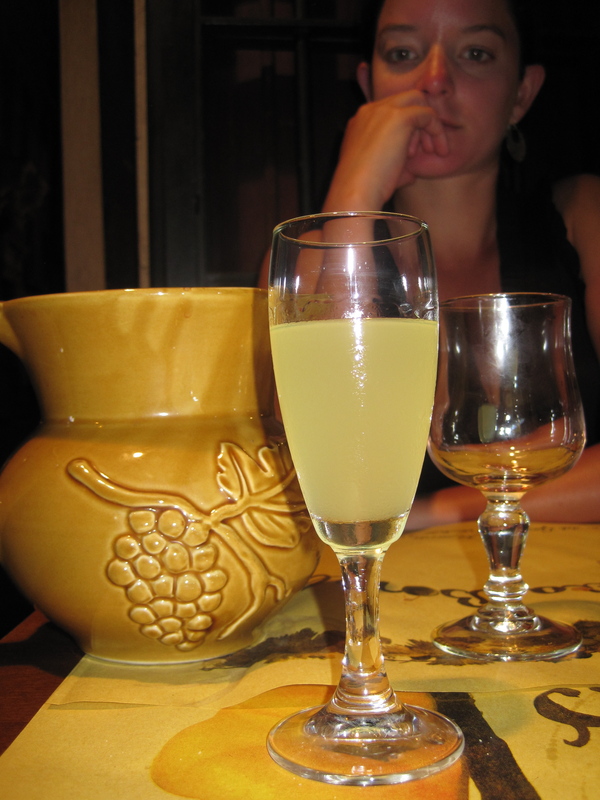 I love limoncello but it never tastes as good in the U.S. as it does in Italy so I generally only have it when I am there. Also, Kristi hates that picture. Early in our relationship, Kristi was getting used to my (awful) taste in music and I was surprised when she particularly enjoyed Kanye West. Basically, I underestimated her and she surprised me. Six years later I was similarly surprised when she adventurously tasted pretty much every odd food item I ordered in Italy. 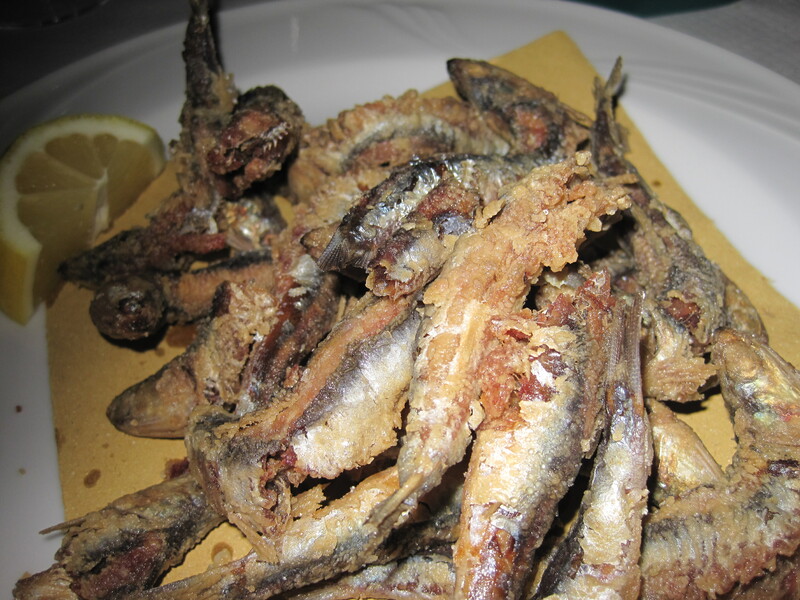 Starting with fried anchovy cakes our last night in Rome. Since each cake was a stack of 10+ fresh anchovy filets, not the salted or oil-packed version we get in the states, the flavor was very fresh and the texture was most similar to whitefish. Really light and tasty. When I added this song to the Italy playlist, it really seemed like a good idea. It reminds me of bad radio on LBI, and generally makes me happy when I hear it randomly. But every time it popped up on the CDs I had the overwhelming urge to skip it. I would describe fried, meat-stuffed olives as the food equivalent to this song. Rich creamery meat filling? Check. Thank god they gave me ten of them. I got these as we dined on the campo in Siena. The place was a tourist trap, and this item was the most unusual sounding one on the menu so it had to be fresh, right? Wrong. 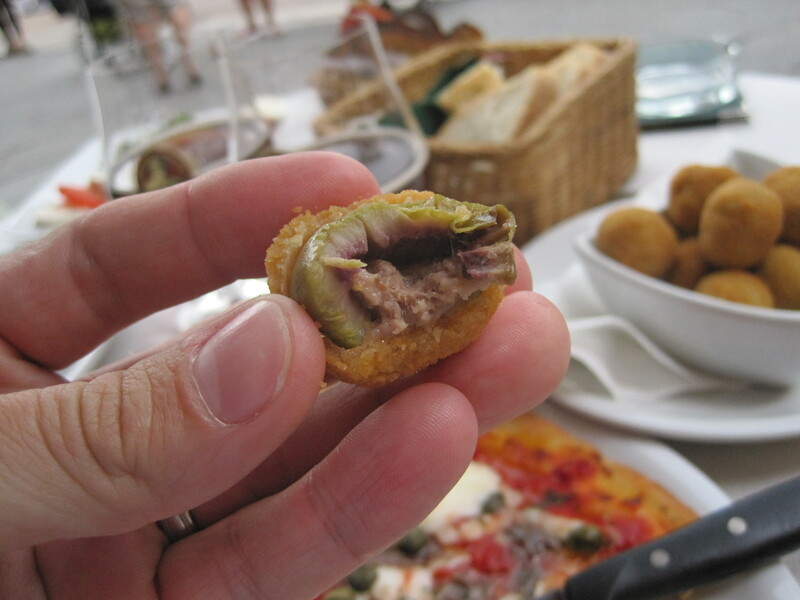 The fried coating was rock solid, the olives were bland, and the “meat” filling was creamy and unappetizing. Clearly came out of some sort of Italian TGIFridays frozen foods box. The 4 I had sat like a stone in my stomach for the next few hours. This song, as performed by my brother and friends’ bluegrass band, has to be listened to and enjoyed any time it shows up on shuffle or on a random playlist. Its that good and it always puts me in a happy mood. When traveling in Tuscany, the same rule applies for any time cinghiale pasta shows up on a menu as it did at a restaurant in Sovicille. After 3 days of fresh made pasta like this in Tuscany, I threw miniature tantrums any time I recognized that I was eating dried pasta. 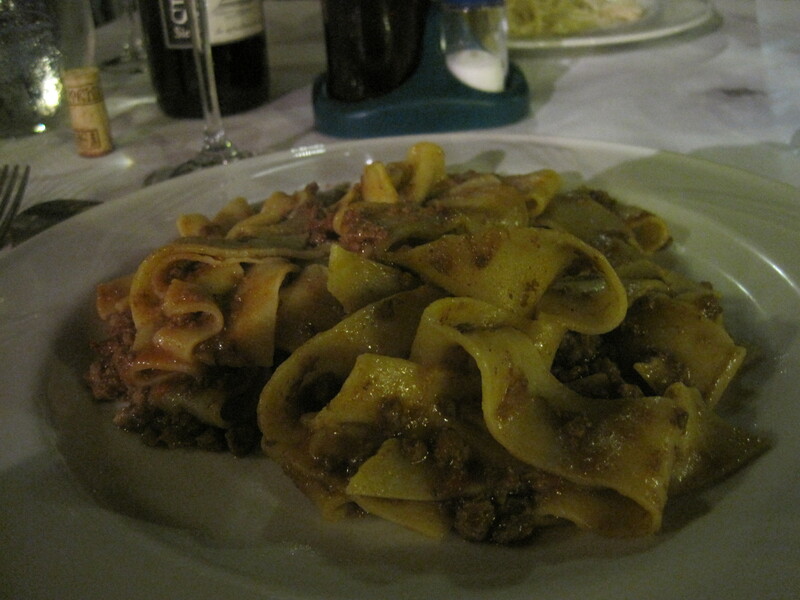 Cinghiale is wild boar, and it’s flavor and texture are like pork crossed with beef in the best possible way. Kristi and I ordered it a combined three times in 36 hours while we were staying at Spannocchia. I will likely attempt to mimic the flavor and texture of the dish with pork shoulder some time in the next few months. When I hear this song I am always impressed by what a badass Johnny Cash could sound like when he was in the final year of his life. He consistently made you believe he was planning to drink a fifth of scotch, smoke a pack of cigarettes, and beat the crap out of someone as soon as he finished singing. Then wash it all down with some rare steak smothered in cheese. Me, I’m only man enough to handle that last part. The San Giminiano version of a philly cheesesteak. 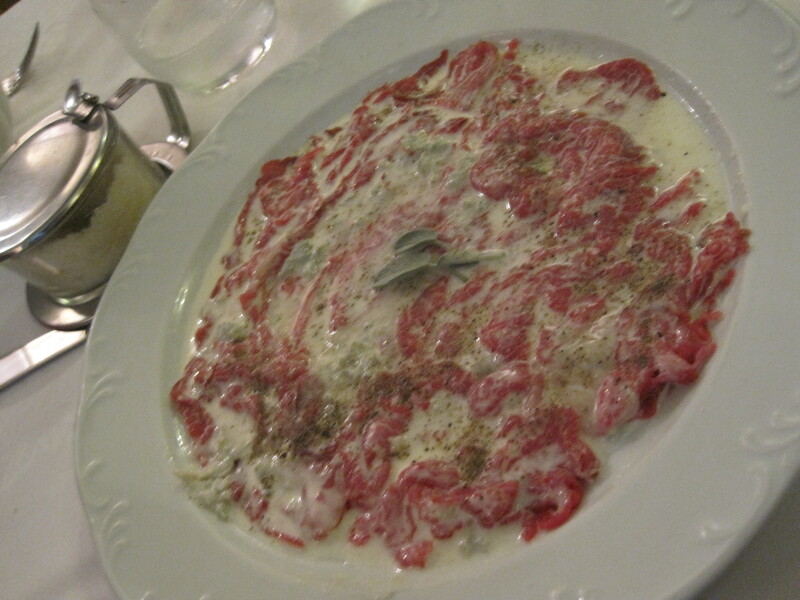 Beef carpaccio smothered with a warm gorgonzola cream, sage, and black pepper. So freaking good. Thanks again for the restaurant recommendation Anne-Marie, I am glad I quietly obeyed your instructions without debate for the first time in my life. Though not my favorite Rolling Stones song, I love how simple and amateur this song sounds; just a few DBish 20-something brits playing around in a basement studio somewhere. It’s a little dirty and uniquely enjoyable. Very similar to the first squid ink pasta I had on the trip at the same restaurant in Sovicille as the night before. No contrast adjustment will make this any easier to see. It was completely black. 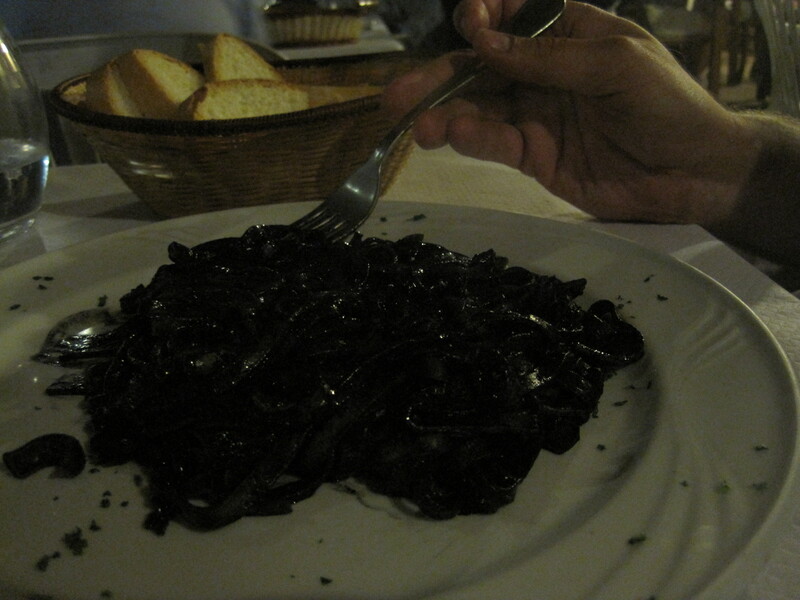 Tagliatale made with squid ink then dressed in a sauce of chopped squid braised in its own ink. It tasted the way a pot full of steaming clams or mussels smells when you take the lid off. I thoroughly enjoyed every single mouth blackening and grimey bite. Probably my favorite pasta dish of the trip. It kinda looks like they’re all playing and having a good time and stuff. But they’re dead and lightly battered. Sardines are a staple of the Ryan family diet along with liverwurst, butter, and Jesus Christ Superstar song lyrics. In related news, none of us are good at sports. 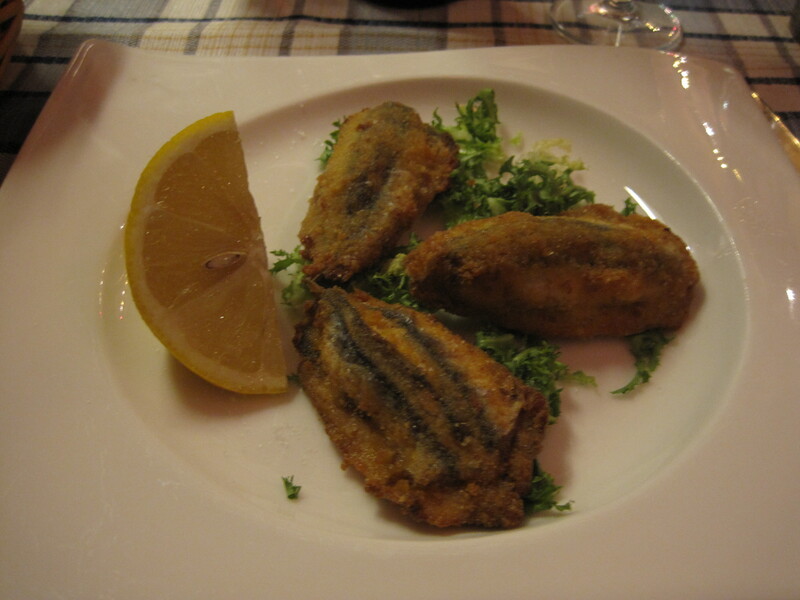 Back to the sardines, they were very good but way too many of them. The heads had a nice fatty crunch, the body was light, and the tails were like fish potato chips. I could have made it through the whole plate with a dipping sauce of some sort, but I was outmatched with only lemon to work with. In complete contrast to Sweet Virginia, this is the aging musician who has done the song a million times and made it better with each performance. You got an orchestra, an applauding Radio City crowd, and the raspy, aged voice of Ray Charles. 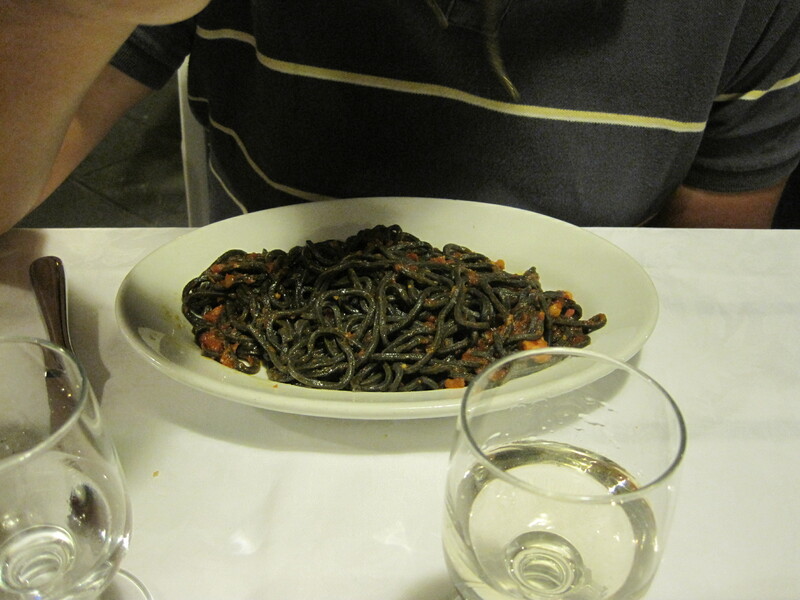 The second squid ink pasta I had on the trip (in Cinque Terre) was equally different from the first one. This one is even viewable in pictures. The simple tomato sauce let the rich seafood flavor of the pasta be the primary flavor. None of the strong shellfishy flavor of the first squid ink pasta. Although I liked the first one more, I could eat this one every night for dinner because it was delicious without being overwhelming. I ended up having it twice in three days. At this point my love of this song is indefensible, and every time I hear it I enjoy it more than I should. When it comes on, Kristi looks at me the same way that she looked at me when I marched out of the Mercato Centrale in Florence with a tub of chicken liver pate from one vendor and a fresh hunk of focaccia from a different vendor. Rich and greasy with a fluffy and heavily salted focaccia for dipping. I love this stuff. This song was first presented to me by my friend Marshall on the camping trip that featured a buried hogs head. He has a knack for playing a song 4-5 times an hour when he thinks it is important for it to be stuck in everyone’s head. When I told him I was heading to Florence where he had studied abroad with his wife 10 years ago, he used a similar approach to pushing the tripe sandwiches by the mercato. I made Kristi walk around looking at crappy stuff available from street vendors for two hours to rebuild my appetite from the chicken liver enough to eat this. If you get a souvenir from us, its from those two hours. Looks chewy, but its as tender as great barbeque. Boiled tripe sitting in a liquid heavy with chili oil before it is chopped and stuffed in a bun with chili sauce, parsley salsa verde and salt. Thank you for making it the only requirement I set for myself on the trip, Mooman. I know that the entire musical movement of quirky covers to pop, hip-hop, and classic rock songs is quickly becoming really, really stupid. But I can’t help myself, and this sweet female voice singing nasty T.I. lyrics is very enjoyable even if its bad for me. Like lardo and head cheese at Giostra. Lardo closest to the camera then head cheese. Lardo is basically just the cured fat of a prosciutto ham. It spreads like butter once it hits room temperature. Butter that tastes like great ham or bacon. I am appalled at how much I ate of that pile. The head cheese was one of the best I’ve had in my life. The flavor and texture had none of the unappetizing notes that you usually associate with head cheese. When I was in middle school we requested this song at dances so that we would have a solid 8+ minutes to work up the nerve to smooch with the braces-heavy gal you were dancing with. That hyphen could have easily been replaced by a comma for me. Anyway, while I still love the song it does run a little long. Too much of a good thing, like white truffle carbonara. 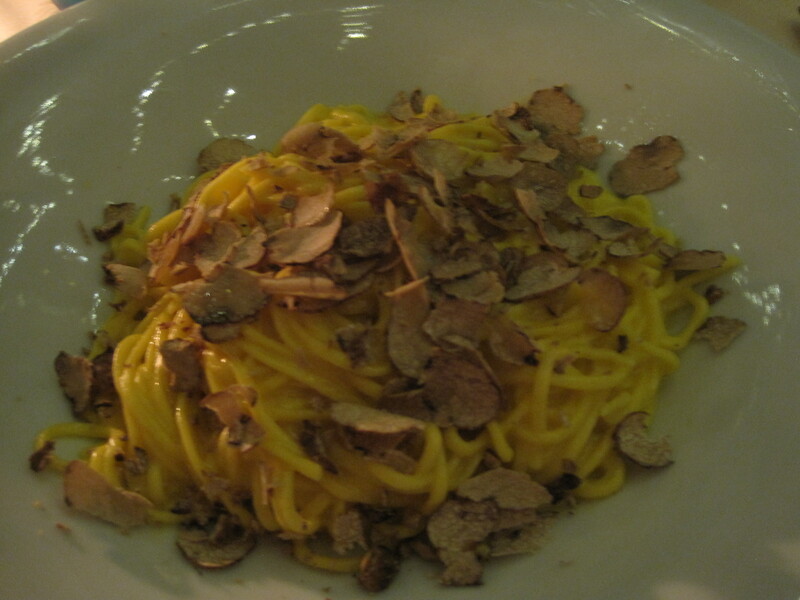 I love the flavor of truffles but the raw almond texture is not that enjoyable when its mixed with rich, creamy pasta. Plus, I ate this at around 11PM and then woke up to fly back to the U.S. at 4AM the next morning. Not a pleasant morning belch, for me or Kristi. And with that the trip was over. Thank god this post is over. It was the type of idea that sounds great because you have 2-3 songs/dishes in mind and then you realize how awful its going to be after you’ve spent too much time to give up on it. My apologies to anyone who put in the time to read this whole thing, I will steer clear of music moving forward. Will also try to get back on a 1-2 posts a week schedule. 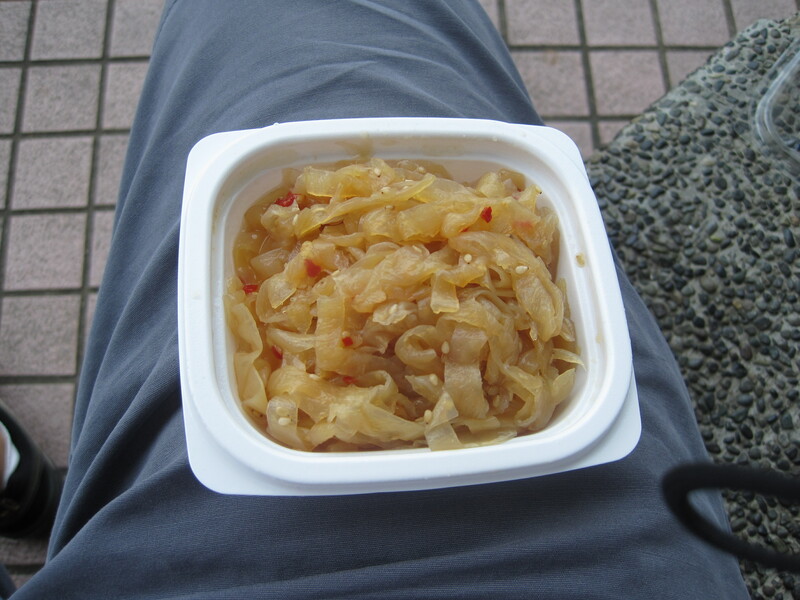 In general I like to eat food that some people would consider weird. Some stuff I grew up eating (liverwurst, sardines, anchovies, etc.) and never considered odd until I saw other people react to me eating it. 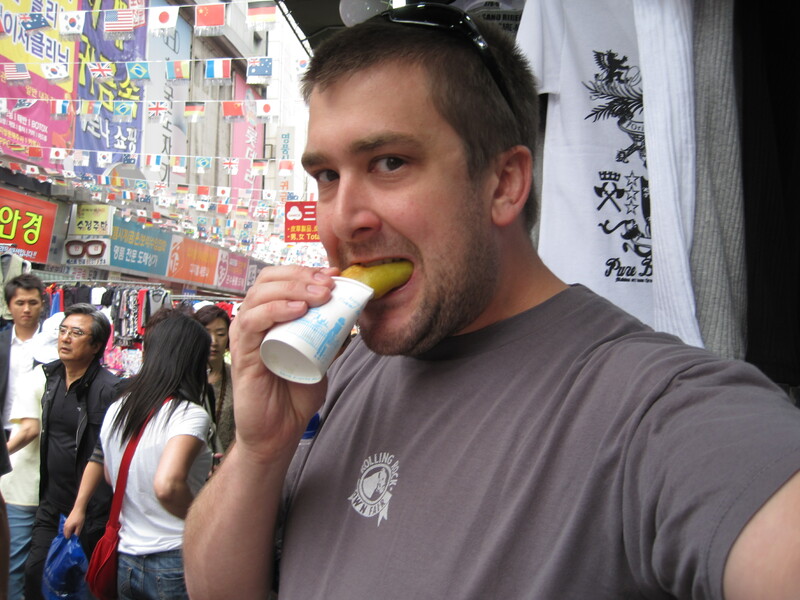 But I also love trying food I have never eaten before which can lead to some interesting and gross experiences. 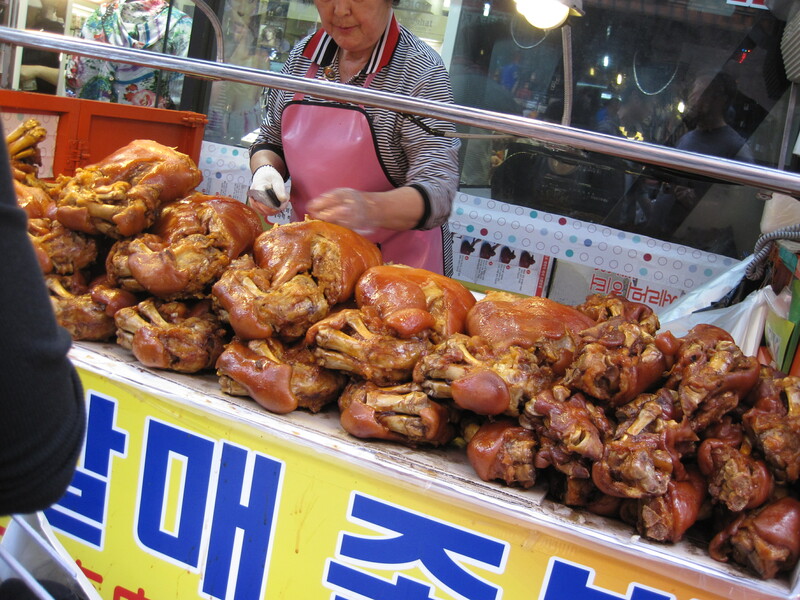 I knew when I signed up for a trip through Hong Kong, Shanghai, Beijing, and Seoul in May that I was going to have a whole lotta chances to try new foods. I knew that some would sounds gross but be delicious, some would be passable, and some would just be foul. Here are the highlights and lowlights of the trip. Hong Kong was the first stop which offered a tremendous amount of options for western and international food, but also traditional Chinese dishes. The second night we went to a famous restaurant that served a set family style menu. They kicked things off with Century Eggs. 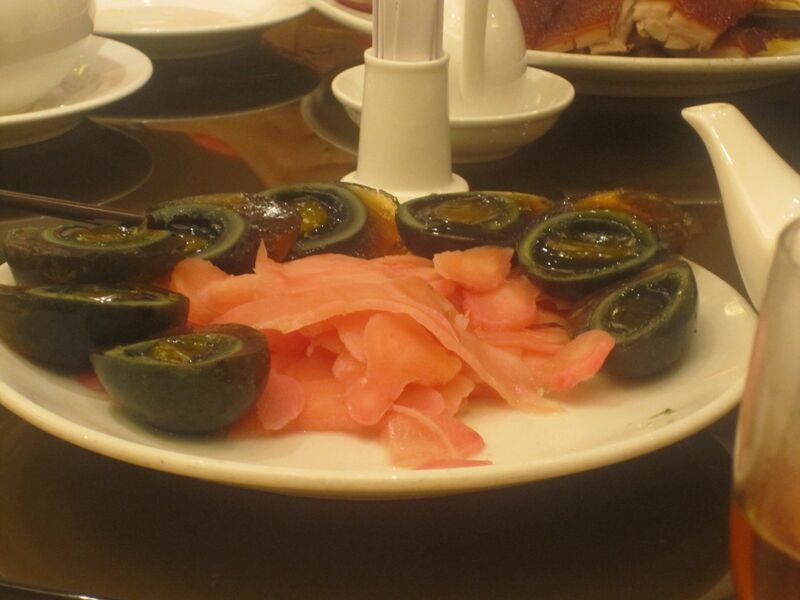 Century Eggs are eggs that are packed in a mix of clay, ash, salt, and lime and aged for a while. Basically, it tasted like a rotten egg. Glad I tried it for the experience, but it was completely disgusting. I would sooner lick the floor of a gas station bathroom than eat another one of these since the indigestion and belches after this were twice as horrifying as the actual consumption. Lets move on. 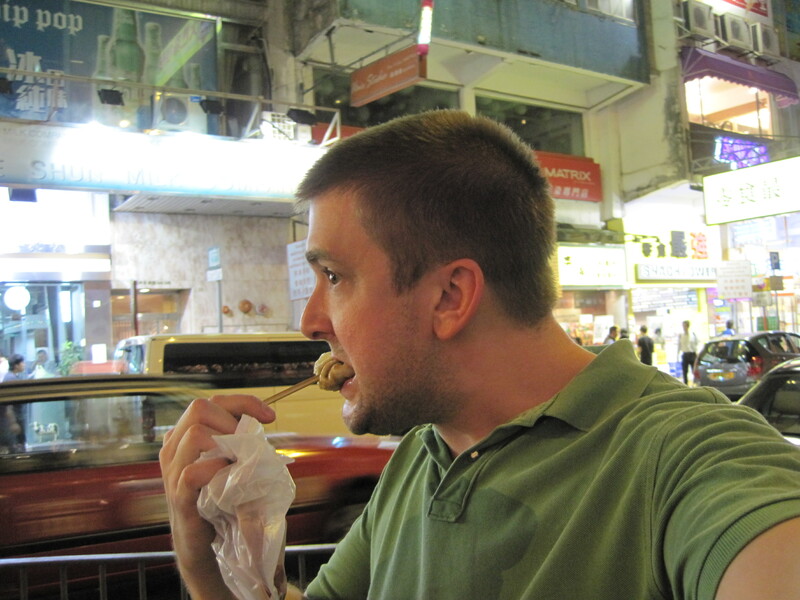 The following day I spent an hour wandering around the Hong Kong version of Whole Foods and eating things as I went. My favorite item by far was jellyfish salad. Jellyfish salad is great and I would recommend it to anyone who loves seaweed salad. Good texture, tossed with sesame oil and chiles, with only the slightest hint that you are eating seafood. Really delicious. 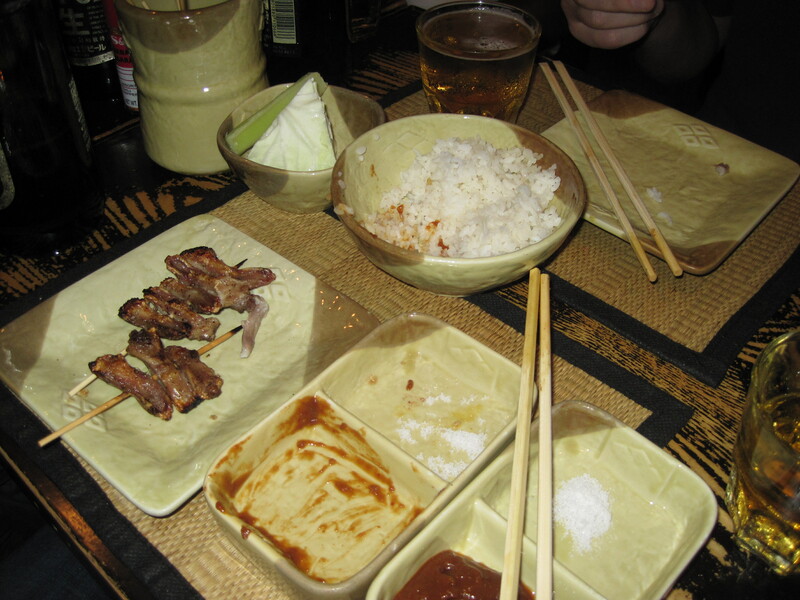 The following night we headed to a popular Yakitori restaurant. Yakitori translates into something like grilled skewers of meat in Japanese, and this place was amazing. Everything that came off the grill was seasoned perfectly, and I think that most everyone at the table would say their favorite bites of food on the trip were at this restaurant. The grilled goose liver and filet were big hits, but my favorite were the duck tongues. The tongues had a hard piece of cartilage running down the center but the meat was the best part of the duck. Rich and fatty with a strong duck flavor, I could have eaten 100 of them in one sitting. Rereading the previous sentence and standing by the claim is a reminder of why I am consistently sweaty, out of breath, and waiting for Brooks Brothers to create elastic waistband suit pants. After four nights in Asia, I was beginning to wonder why I hadn’t eaten more street food so I headed to a more authentic area with a few friends to wander around eating. 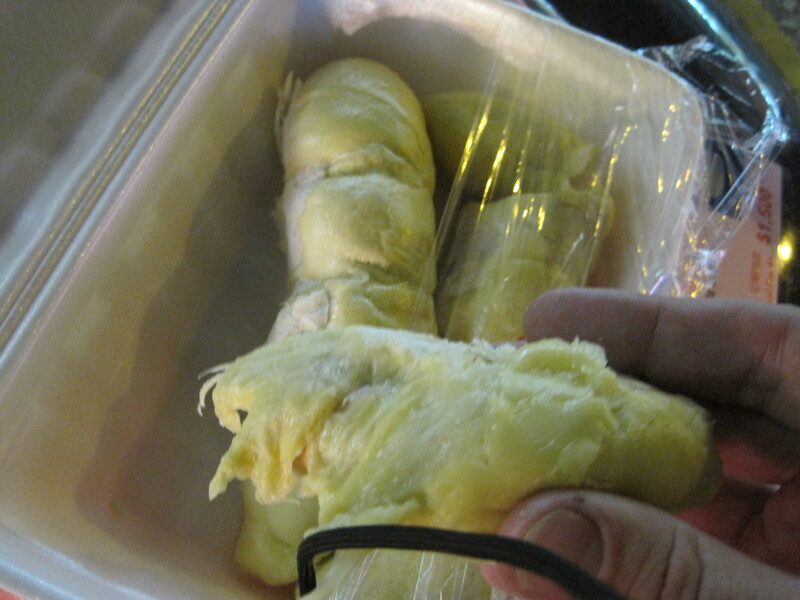 When I saw Andrew Zimmern’s nemesis the Durian, I knew I had to try it. I purchased one that was cut open and put into styrofoam. 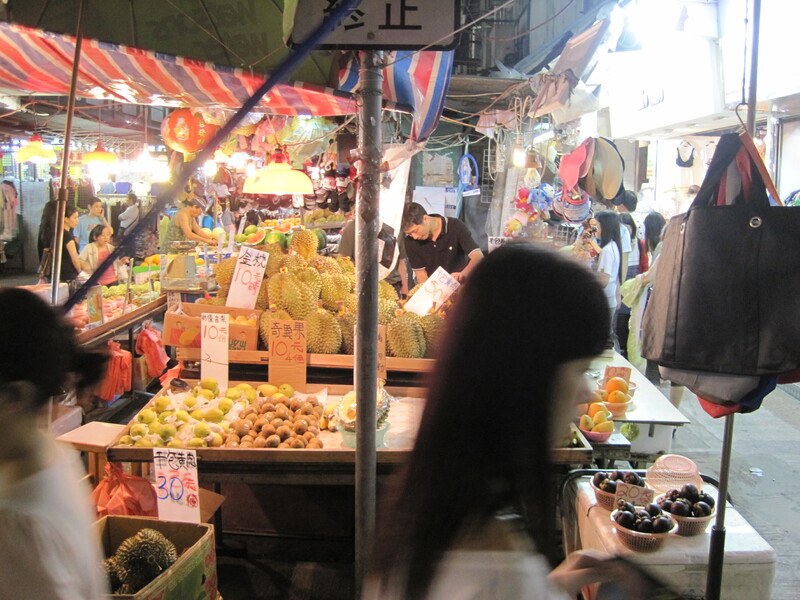 I really expected to be knocked over by the odor but markets smell terrible anyway and it was impossible to differentiate the durian from the other funky aromas. I remember being nervous about my hands smelling like crap from touching it. Sooooooo, why did I eat it, and more importantly, why do I look like I have a big toe for a thumb? 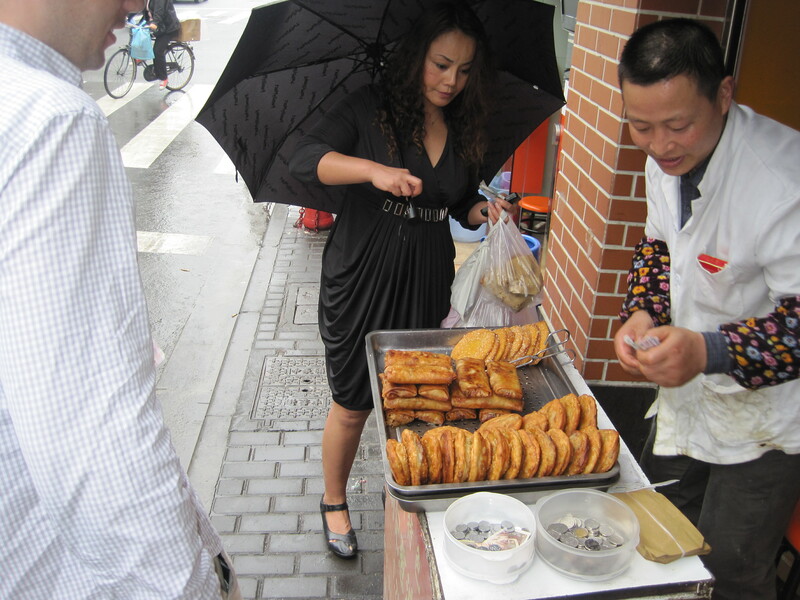 The next day we headed to Shanghai where our hotel was surrounded by a lot of street food vendors serving food that was ill-advised for our western systems. 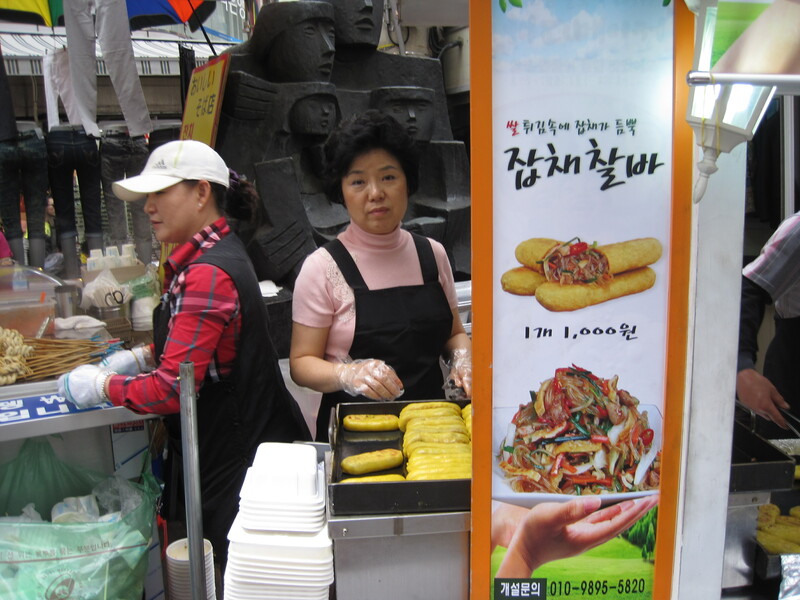 But this scallion pancake stand became an important part of my daily diet. 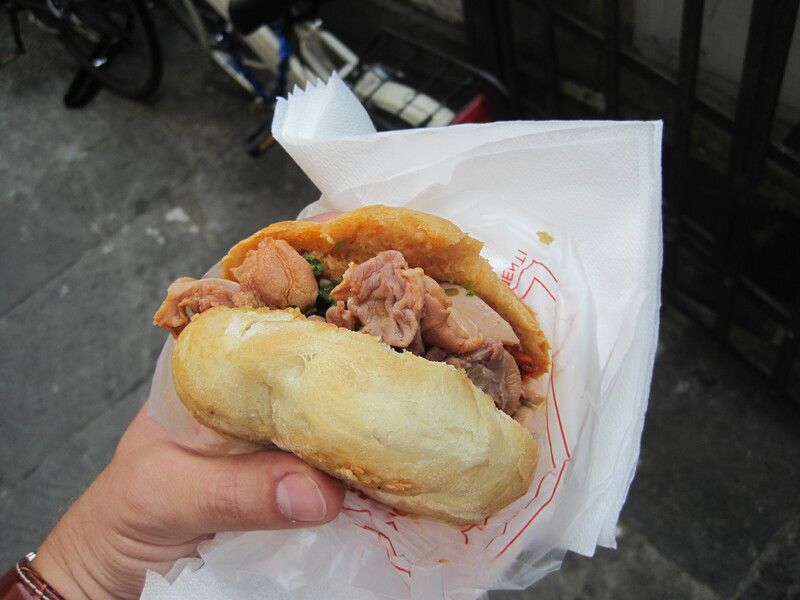 I ate about 10 of these over my five days in Shanghai. Not an adventurous item, but I had to include them in the list just because of how cool it was. I will likely never be able to enjoy the cardboard-like pancakes I get the in the U.S. again but it was worth it. Later in the stay I got bored at a museum and once again went searching for food on the street where I discovered a great Takoyaki place. Takoyaki are Octopus dough balls. 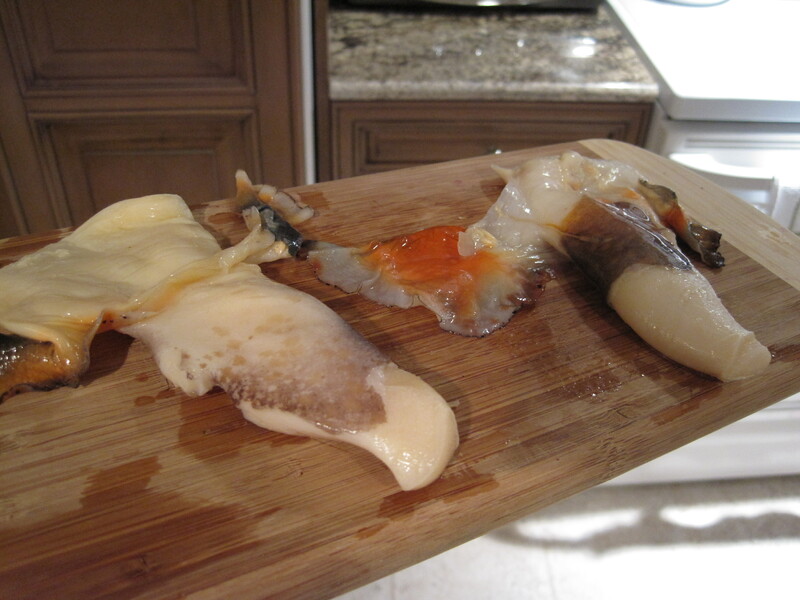 Each partially cooked one has an undercooked center with maybe one or two pieces of chewy octopus but the traditional unidentifiable garnishes on each one make it delicious. 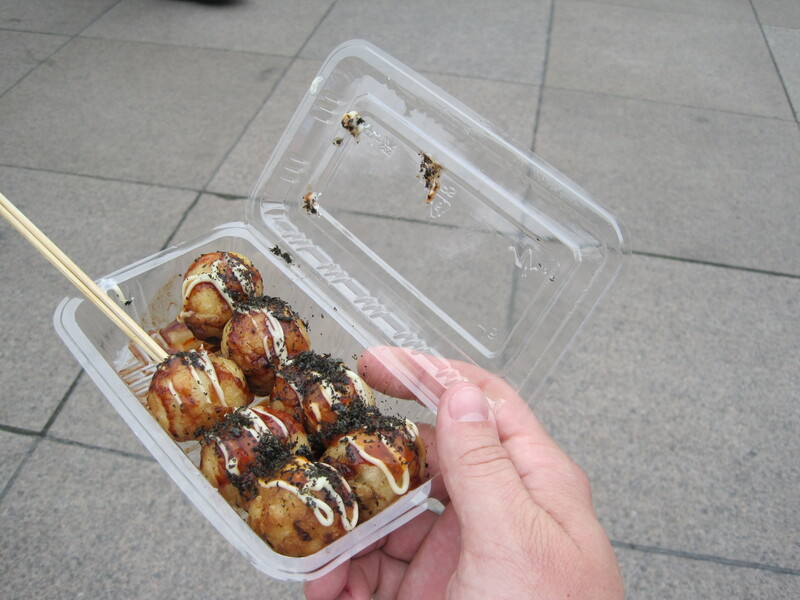 I hope Dunkin Donuts starts making Takoyaki munchkins soon. Last food item in Shanghai was unfortunately from KFC. 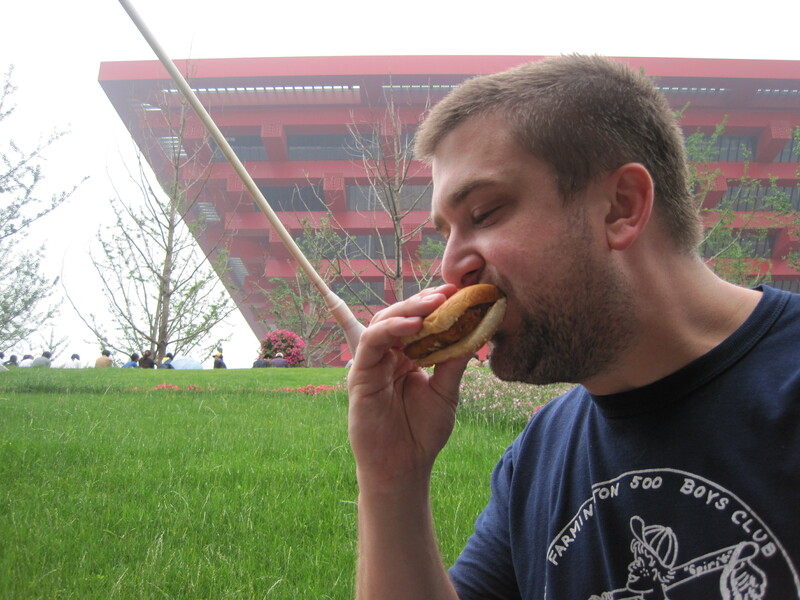 At KFC in China they serve two sandwiches: a dark meat spicy chicken sandwich, and a shrimp burger. 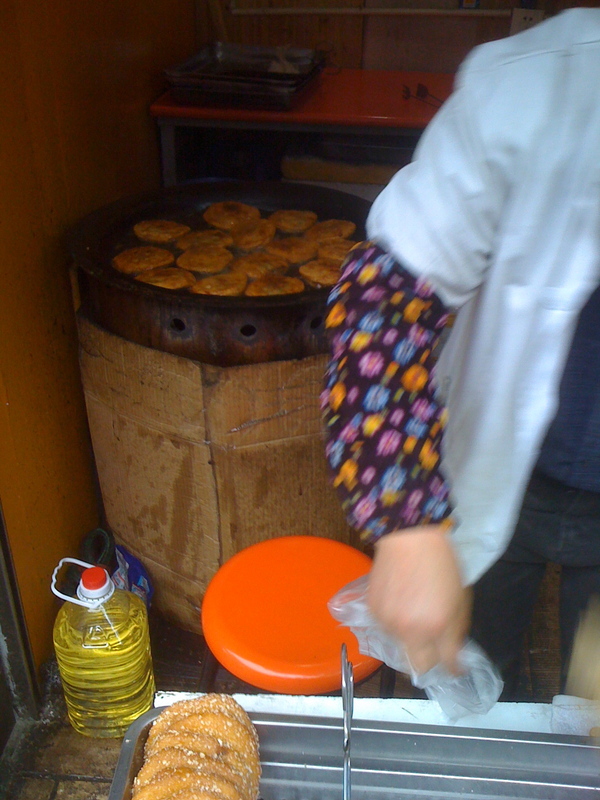 I got the shrimp burger, basically 20-30 small prawns kept whole, made into a patty and fried. It was gross and delicious like fast food should be. The next stop after Shanghai was Beijing where we spent four nights. 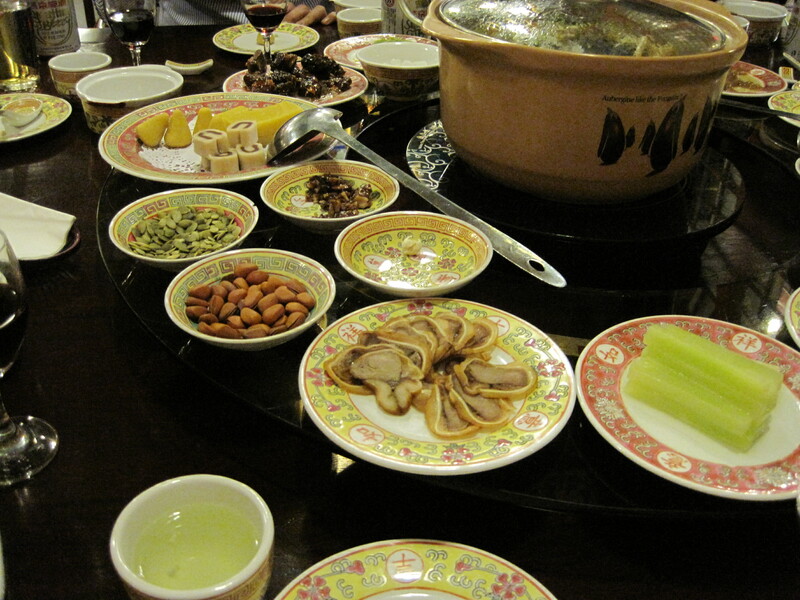 There was only one notable meal which was a traditional hot pot banquet that caught us all a little off guard. The garnishes and items put out in advance were a plethora of odd foods to try including chilled sliced pig ear (pre-hog head roast), jellyfish salad, century egg-style quail eggs, and bean paste sweets. 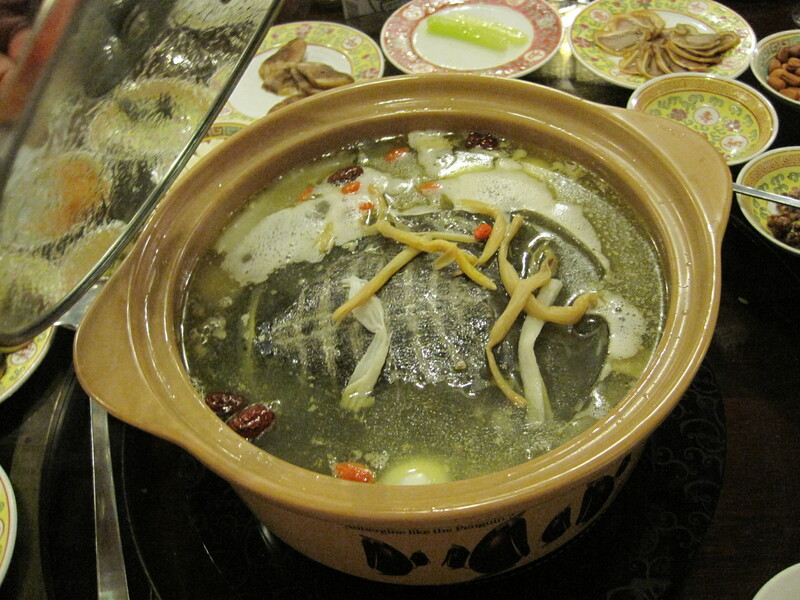 But the hot pot was the oddest item since it was a turtle-based hot pot. The turtle meat tasted like slightly fishy chicken and was pretty boney, but the toughest parts were small inflated green sacks of liquid that tasted exactly how you expect a reptile to taste. Not my favorite thing but a good experience. The final stop on our trip was Seoul, South Korea. On the last day, after eating safe meals at the hotel and Korean barbeque I got the urge to seek out some final odd foods before I left. So I headed to the market and found what I assumed I would be able to sample regularly but hadn’t had the chance to: insects. 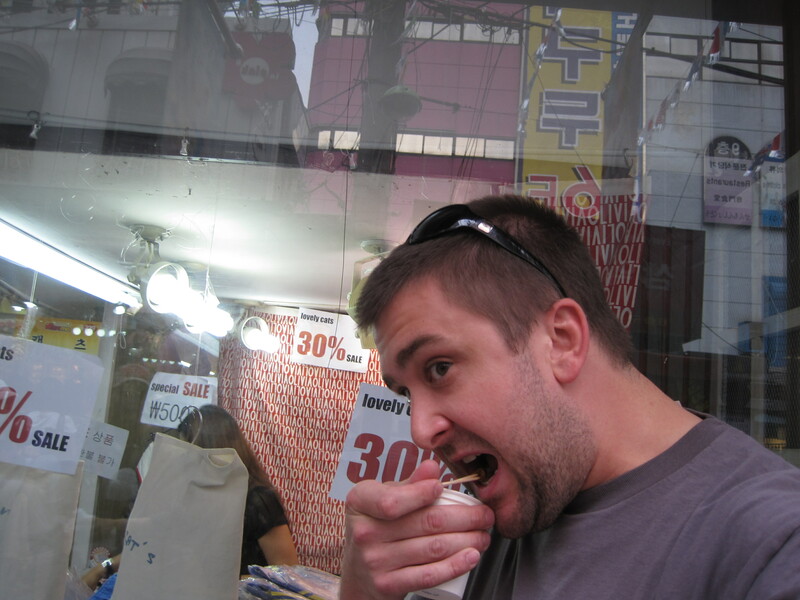 I heard that various insects had a shellfish-like flavor and intended to sample a wide range of them during my travels but didn’t have the opportunity. 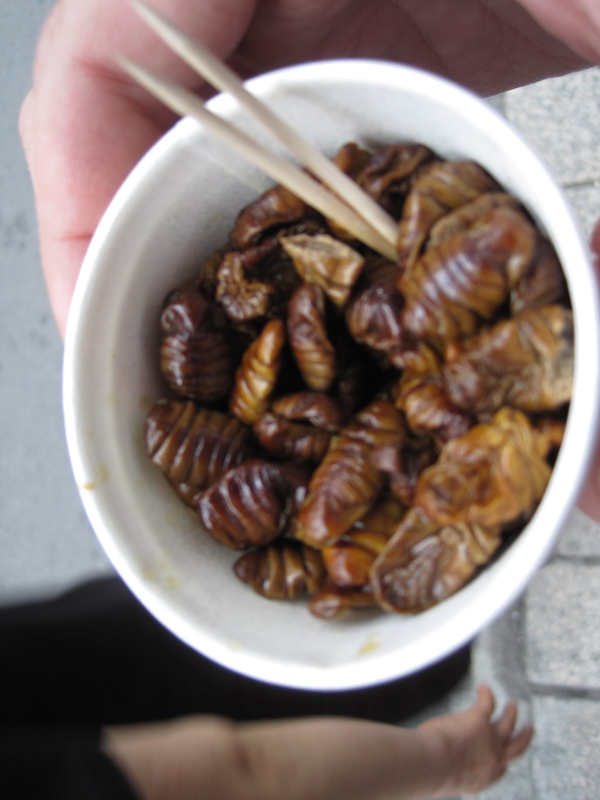 These silkworms were the first edible insects I had seen and they were everywhere in the market. No other insect offerings, though. So I took what I could get. 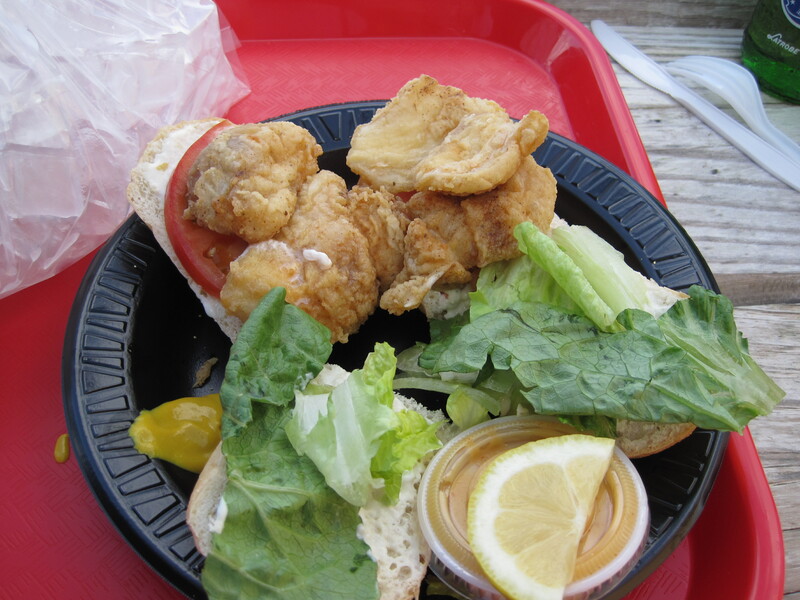 They had a texture and taste that was reminiscent of soft shell crab with a musty flavor added in. This was the second food I ate on the trip that I would describe as musty after the deep fried fish heads in HK that I didn’t get a picture of. Anyway, I had a few but had no chance of finishing the cup so I moved on to other stuff. This was deliciously junky and the Korean equivalent of a Lewiston, Maine Luigis spaghetti calzone: celophane noodles, kimchi and beef wrapped in a rice dough and deep fried. 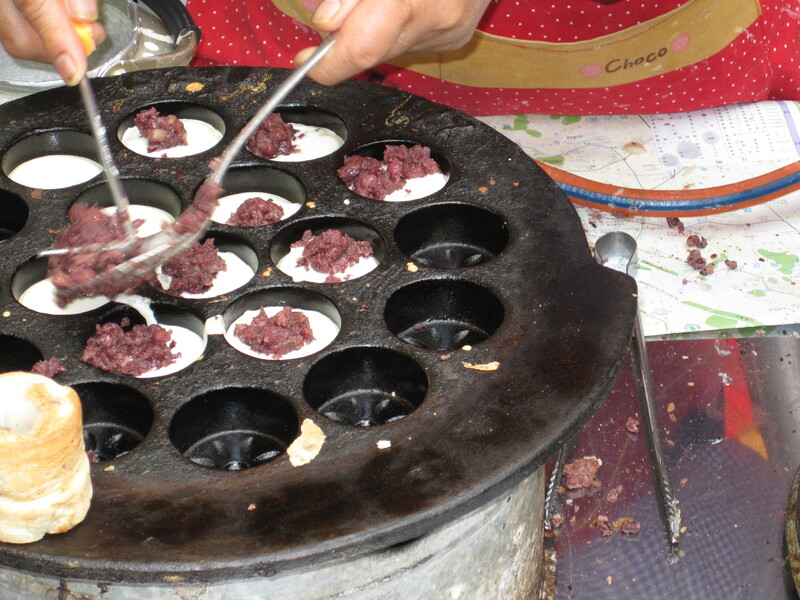 Next up was a bean paste “donut” that I thought was gross texture-wise and also way too sweet. The cooking process was pretty cool, though. As a grand finale, I decided to give a shot to one of these stands that lined an entire street. I mean... what the eff is that? I eventually decided on one that had a long line of locals and requested a small portion. My guess is that it is some sort of smoked pig trotter though I really have no idea. The woman manning the stand took it apart expertly. Speaking loud and slow, "Small! So! What! Is! This! Yes, Small!" 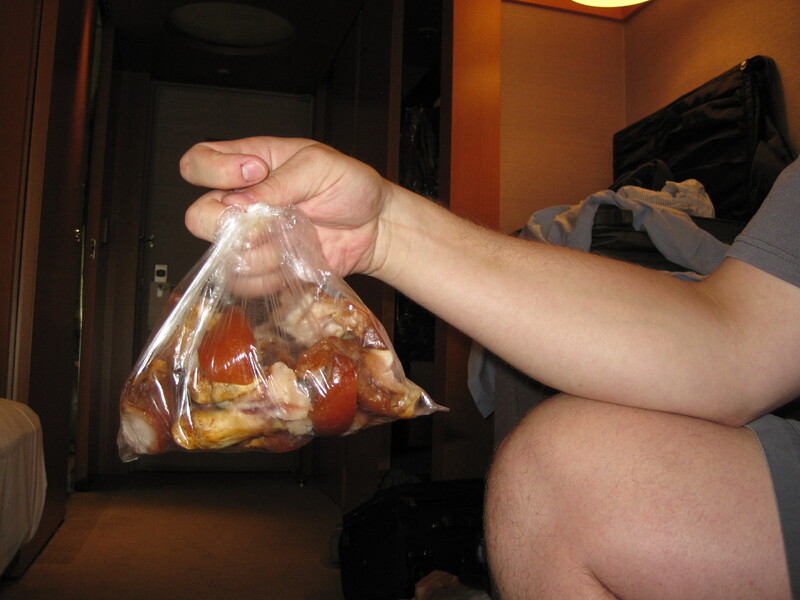 She put it all in a small plastic bag and I headed back to the hotel. En route I started to get nervous about eating it because it appeared to be intended to be cooked more and it was handled with some bare hands along the way. I went to a friend’s hotel room to decide. Thankfully, the instruction to “do not f***ing open that bag in here!” led to me throwing the bag away. A little bit of a pathetic end to a great eating expedition, but since I spent the following 36 hours traveling by bus and plane I am happy about the choice. Future “Weird Crap I Eat” entries will be much shorter, but wanted to share this trip as a whole.